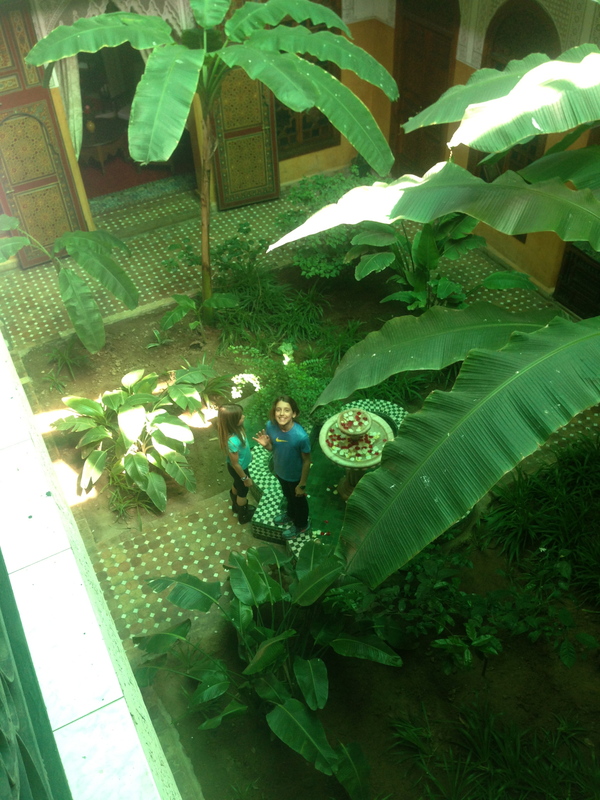 The morning of our 5th day in Marrakech we checked out of our riad in the medina and headed out of town. 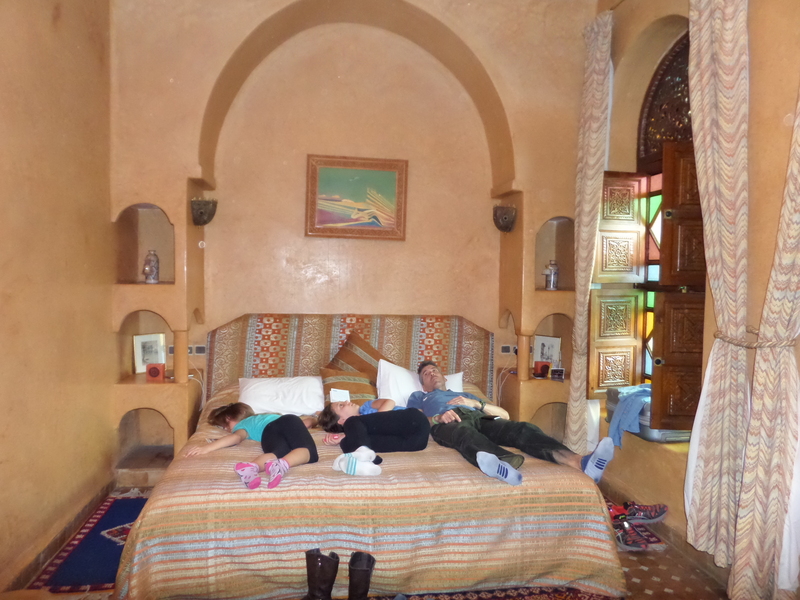 We booked our last couple of days in Morocco at a fancy resort. 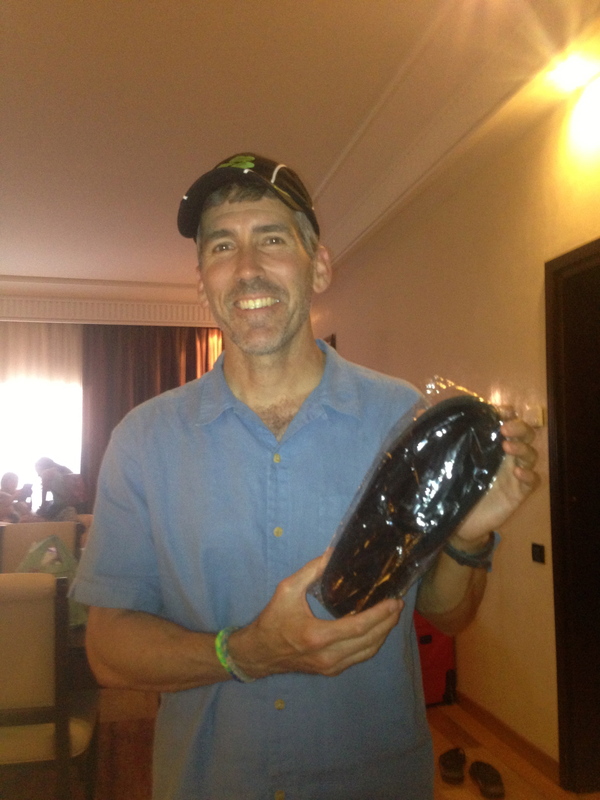 Fancy hotels even give you free slippers! Cathy, Jessica and Catherine spent the day with us as well. We checked in and changed into our bikinis right away. Well, Mike wore trunks, sorry ladies! The girls played in the pool while Mike, Cathy and I lounged in the sun. 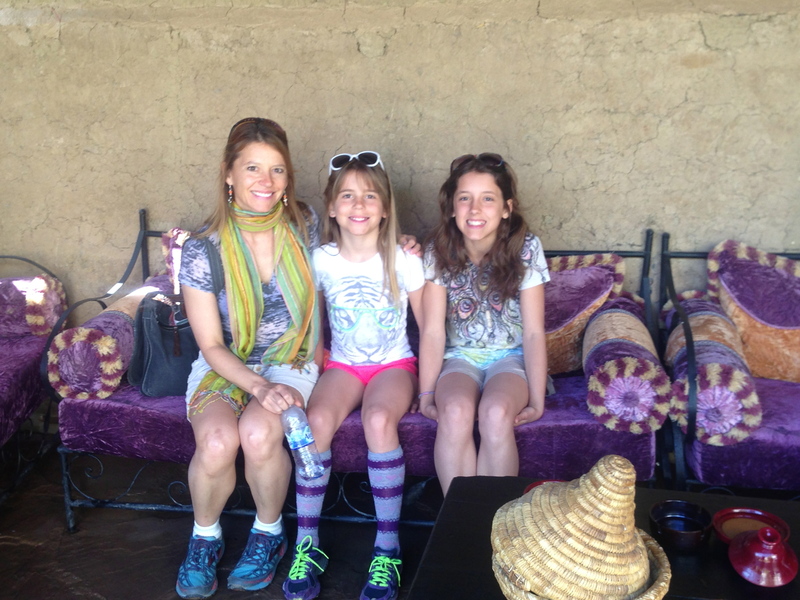 We visited and sipped our drinks under the warm African sun. We savored our last day with Cathy as she would be heading off on an adventure to the desert in the morning. 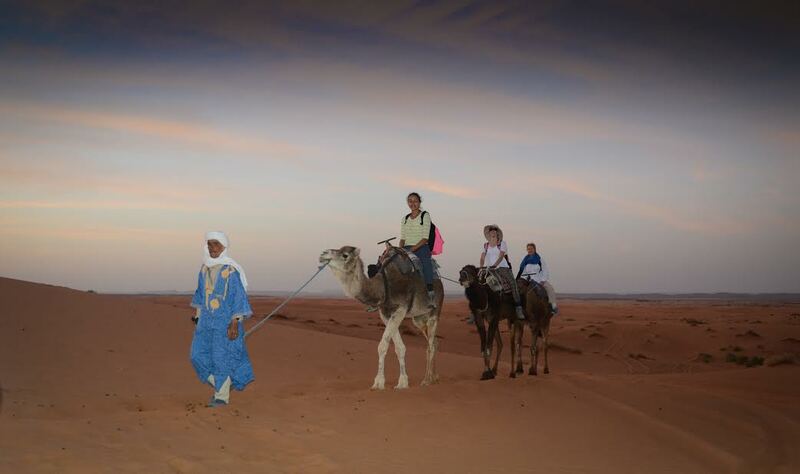 They drove across the Atlas mountains to the end of the civilized world then continued on dromedary back. Cathy is going to have to write a guest post so we can find out the details of their adventure! 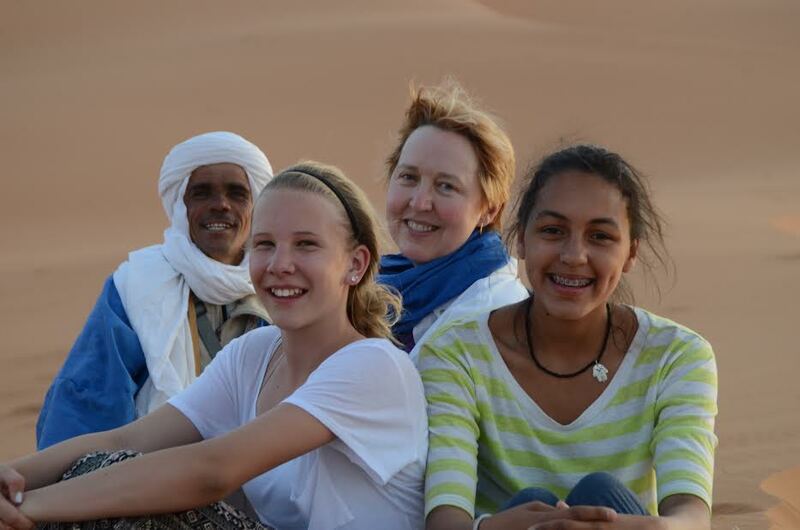 Cathy, Jessica and Catherine’s camel ride looks more authentic than ours! 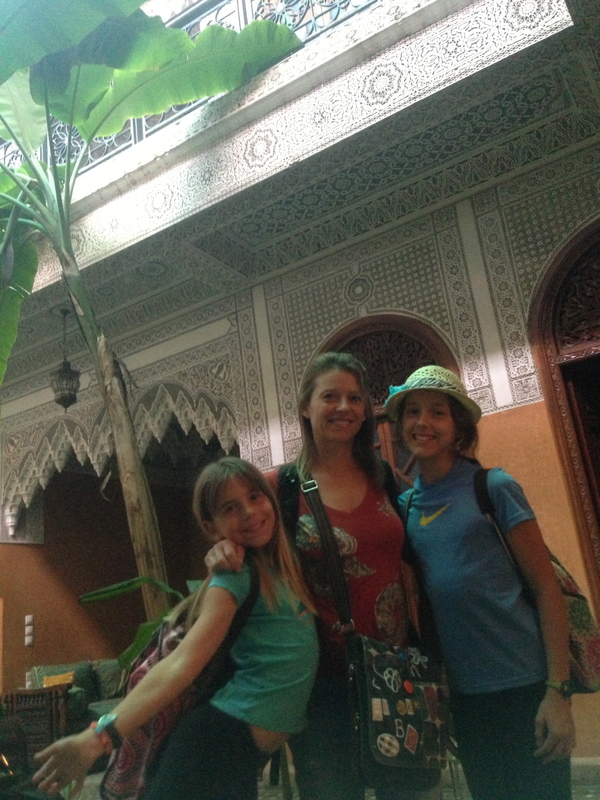 Our last day we enjoyed an amazing, exotic buffet at the Kenzi Palace. My favorite was a fruit spread that was made of mashed oranges, cinnamon and honey. 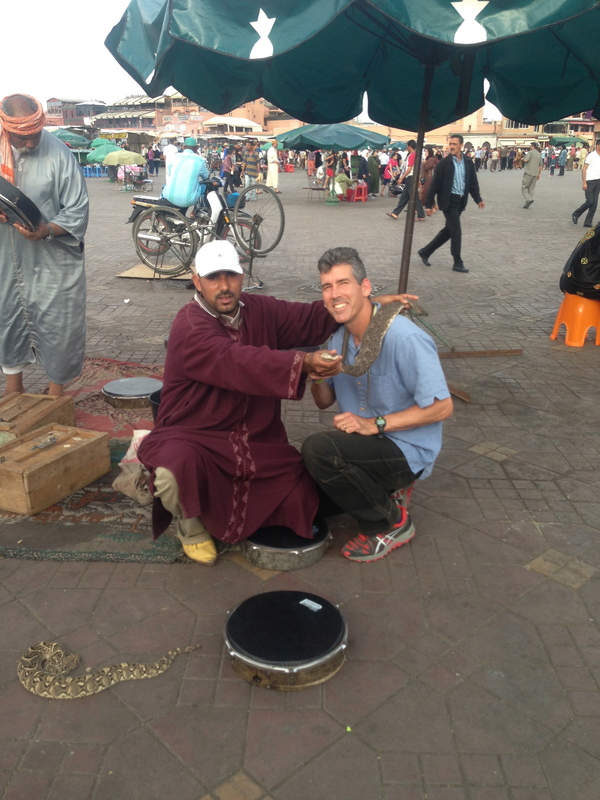 I ate it on warm Moroccan bread. Heavenly! 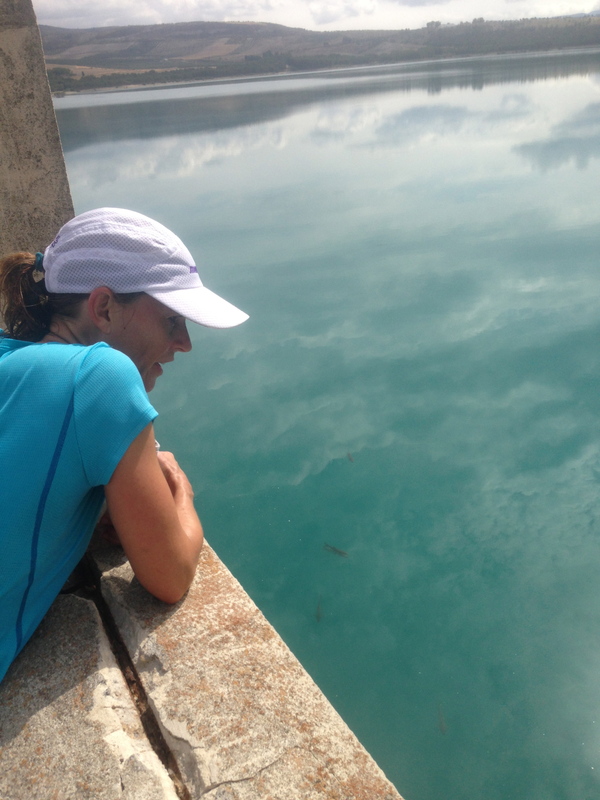 To me no trip is complete without a good hike or even better, a really long trail run. 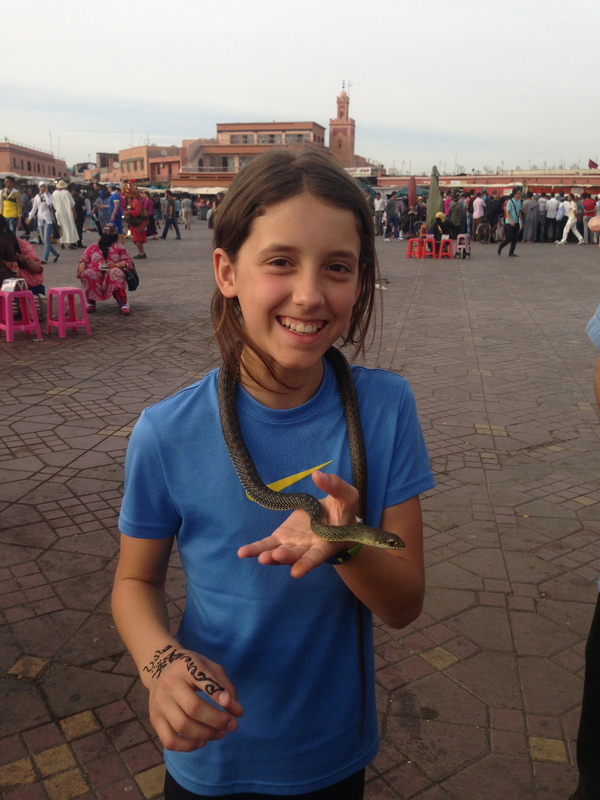 We spent the majority of our time in Morocco in Marrakech so we were ready for some nature. 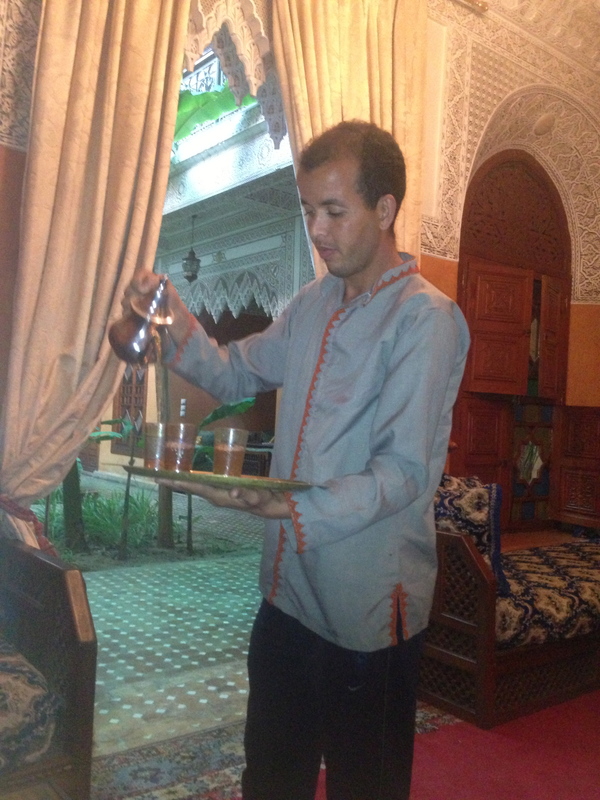 Abdul, our driver who took us to ride the dromedaries, picked us up at the hotel. 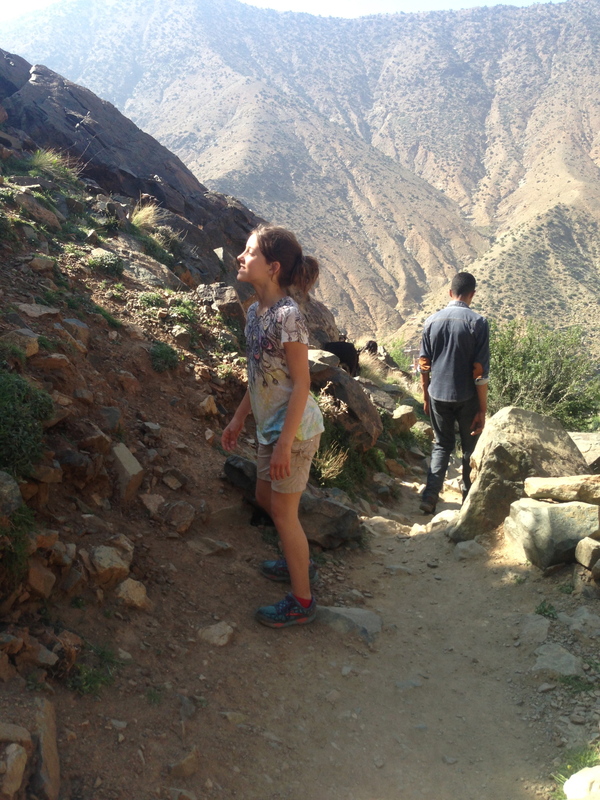 The plan was to visit a Berber village in the Atlas mountains and go for a hike. As we drove out of town Abdul explained that we were headed to the Ouika Valley. 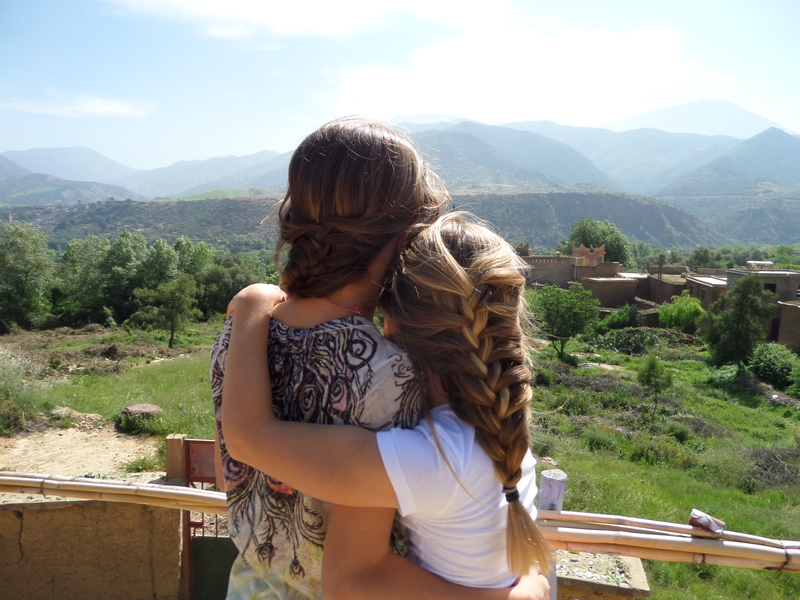 We drove for an hour to a Berber village called Setti Fatma which I imagined would be a remote, quaint little village. Instead, as we neared the village the road became dense with cars. 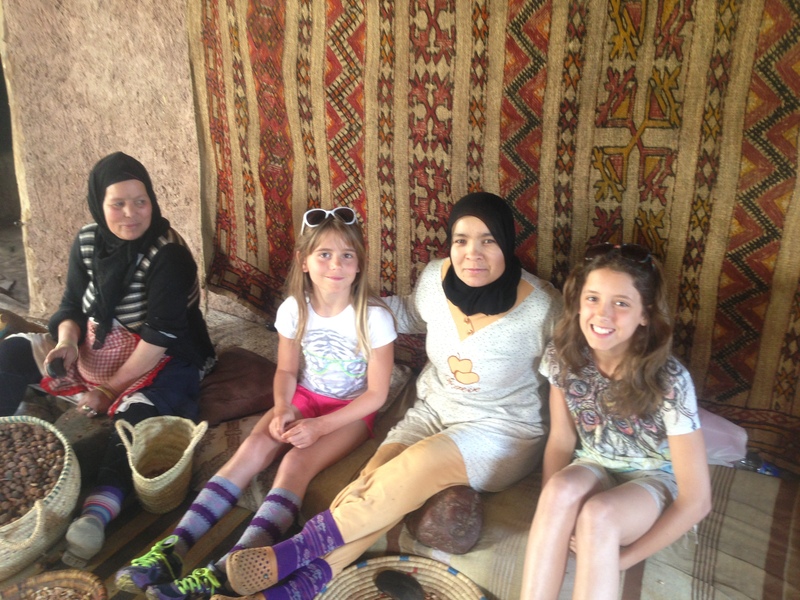 We stopped at an Argan Oil Co-op where the women demonstrated how the argan nuts are cracked then ground and turned into oil. 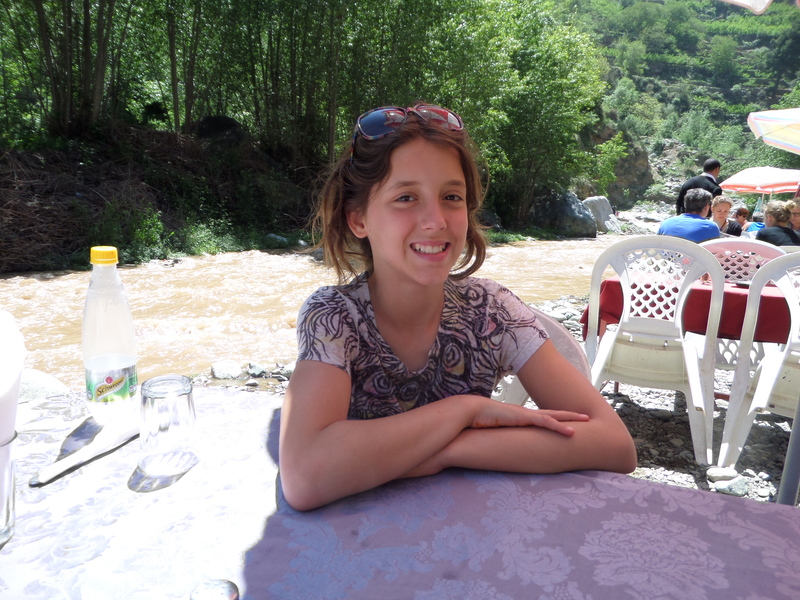 Our guide was delightful, the girls liked her immediately and they even let her braid their hair. 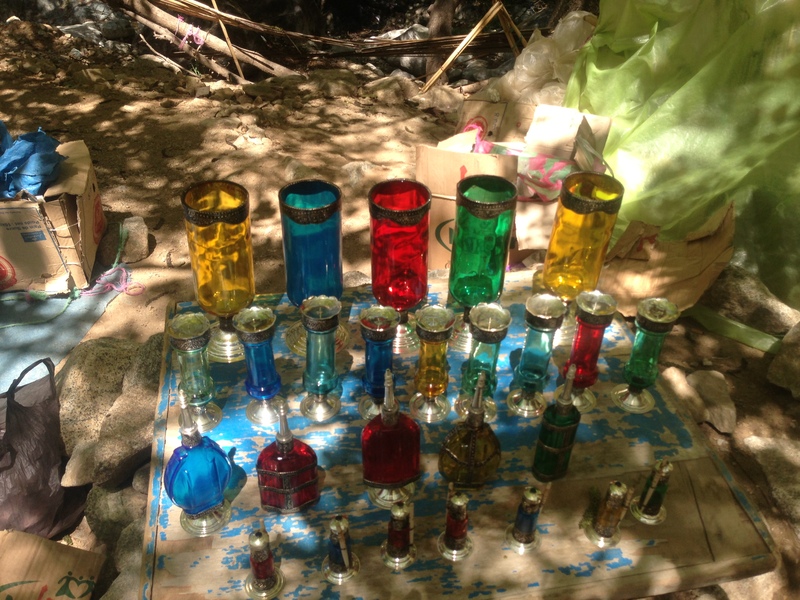 We bought several bottles of magical Argan Oil. She promised that one was specifically formulated to clear skin blemishes. I was skeptical but before bed that night Sky put the oil on a little patch of acne on her nose. Amazingly after one application and a day of swimming in the sun the next day the patch had completely resolved. Youth, the sun or the oil? Your guess is as good as mine. 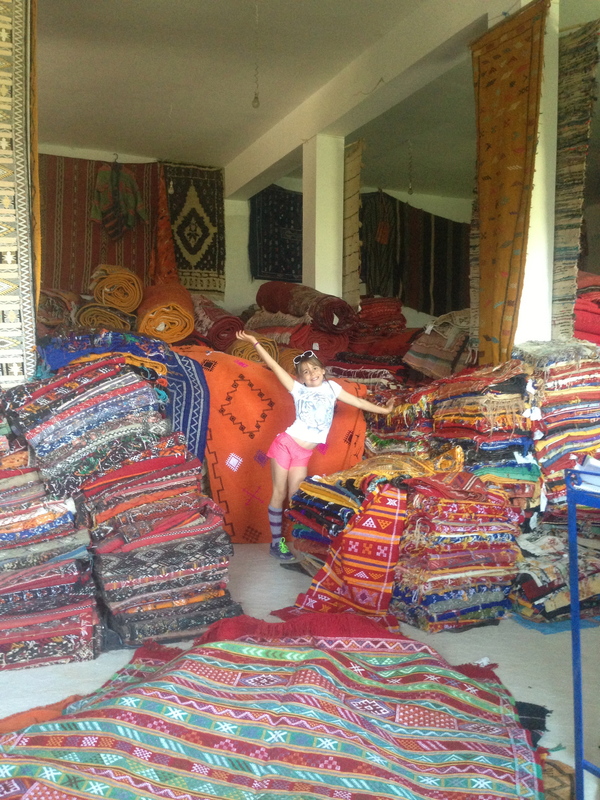 Our next stop was a rug store. 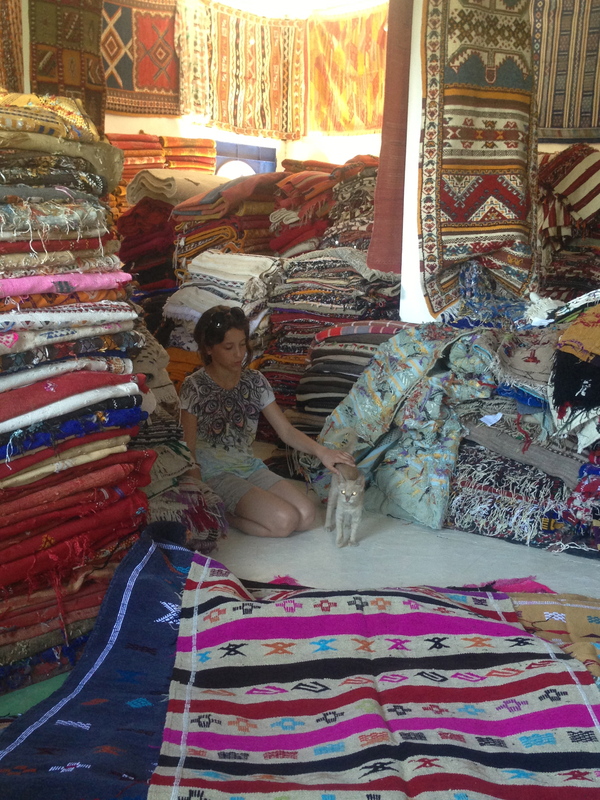 Of course we were perfectly aware that our guide had a vested interest in our purchases and I had no intention of buying a rug but we were curious just the same. Savvy with the rugs. Give her a job! 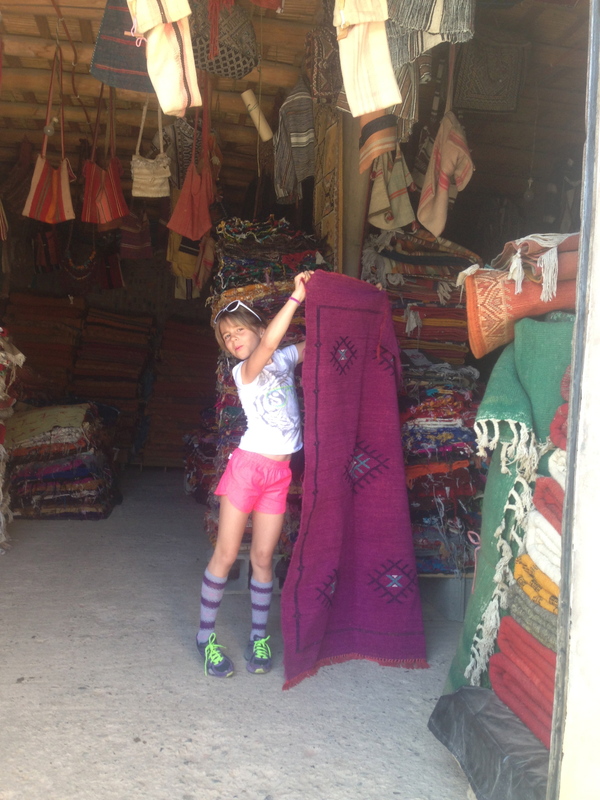 The man in the rug store showed us rug after rug but wouldn’t give me any idea of the prices unless I would choose one. Strangely, it was very rushed and stressful. Finally I told him that I liked one and he told me the price. It was outrageous and I suggested that we leave. Suddenly the price was a 1/3 of his original offer. I know that is typical but I was surprised. We left and I think our driver was a little annoyed with us. 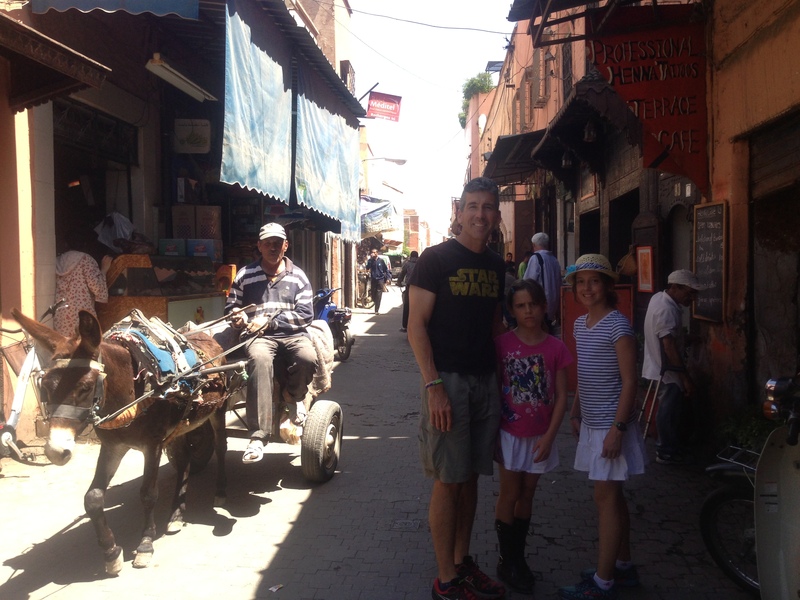 The “typical” Berber village turned out to be a typical tourist trap but it was still exotic to us and we enjoyed it. 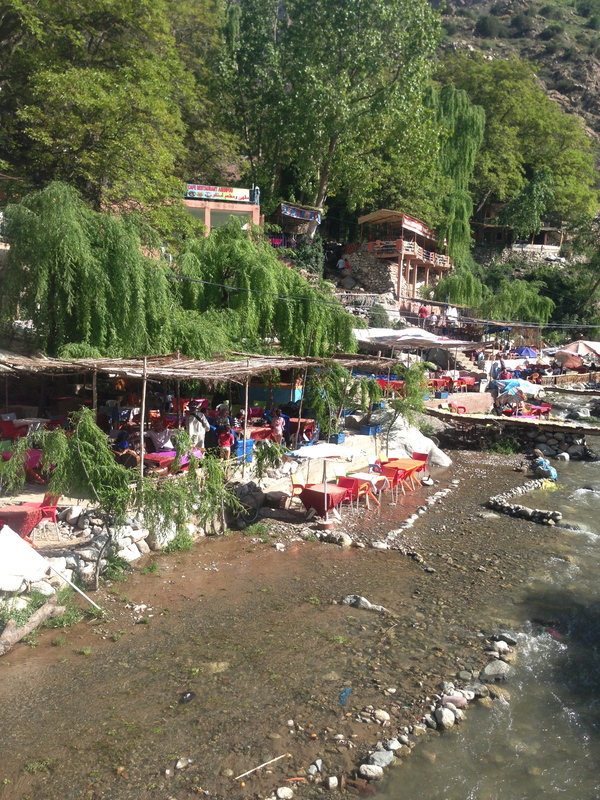 We dined on a sandy bank of the Ourika river on plastic tables under colorful umbrellas. Cheesy strolling minstrels played for us and posed for pictures. Sky ate eggs and as usual, a pack of stray cats found her. Sky is a cat magnet! After lunch our hiking guide, Jamal was waiting for us. 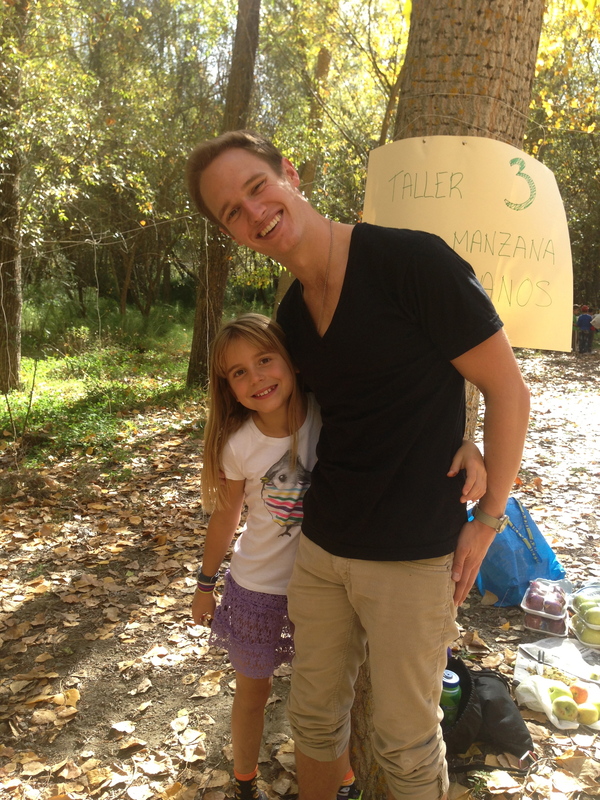 He was a cheerful, 25 year old who spoke excellent English and even some Spanish. Jamal told us he grew up in Setti Fatma. 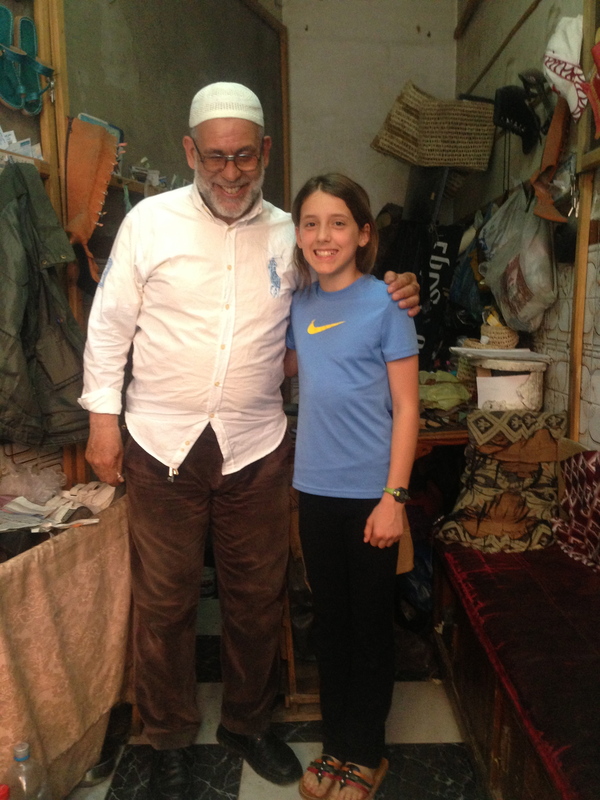 He learned his English in school and explained that schools in Setti Fatma are taught in Arabic and French. Anyone who attends school is fluent in both. 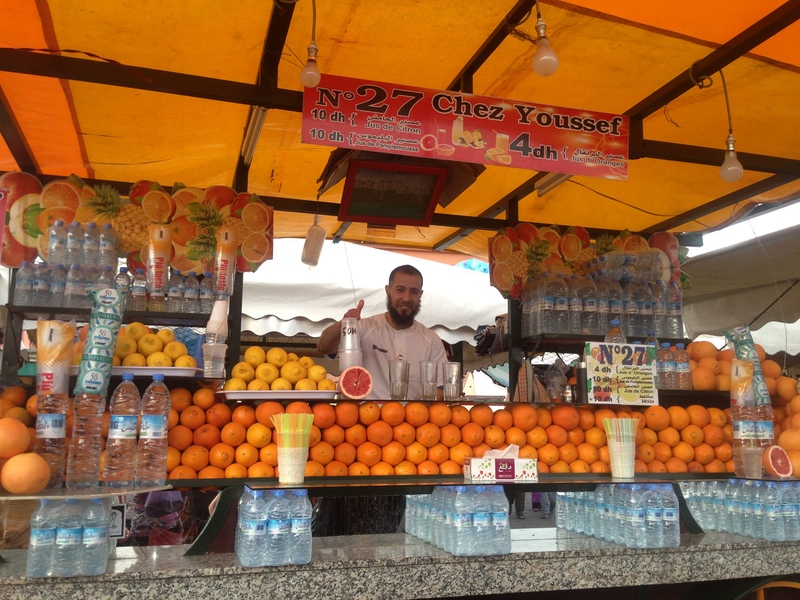 He also spoke Berber but pointed out that he could not read or write the language of his ancestors as it has a different alphabet and it is not taught in the schools. 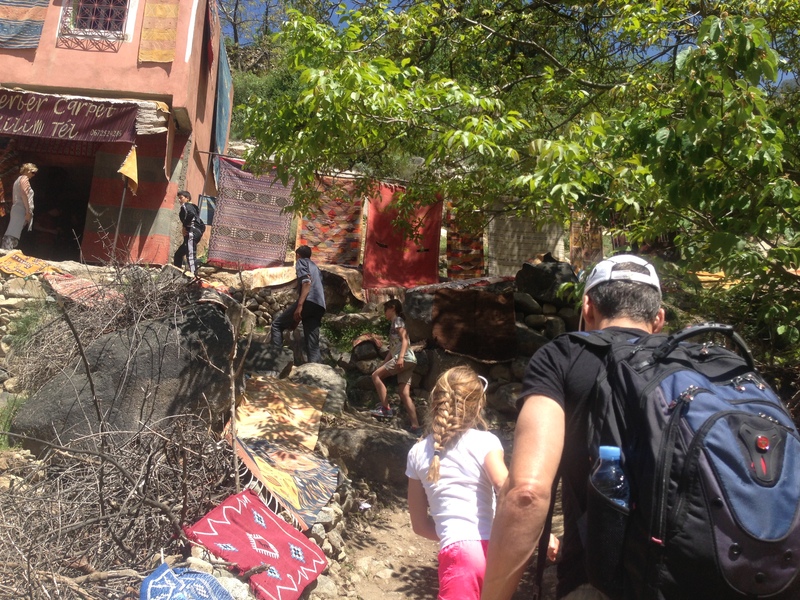 Jamal led us through a cacophony of vendors on the way up the mountain. Up the hill past 100s of tables of stuff for sale. I love to shop but this was really too much even for me. We finally passed most of the hikers and shoppers. Up the trail to the 7 waterfalls. 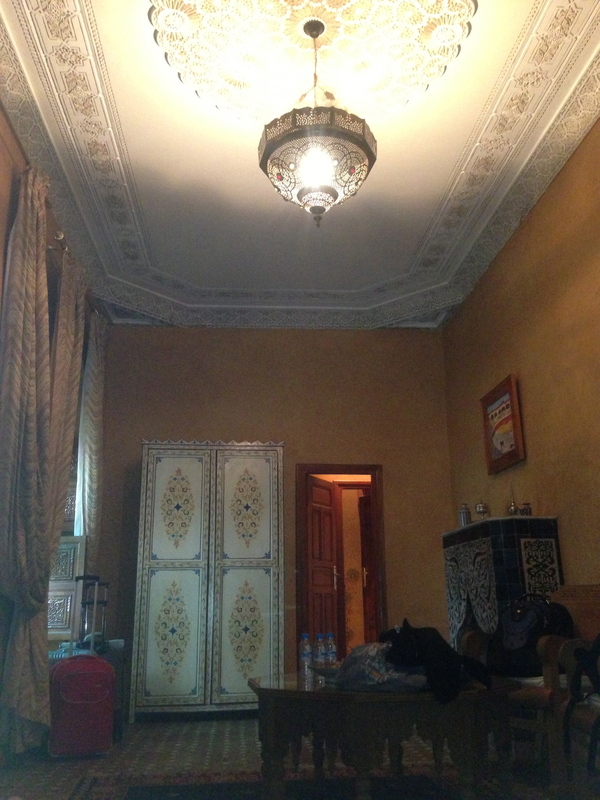 Jamal pointed out the “Berber refrigerators”. 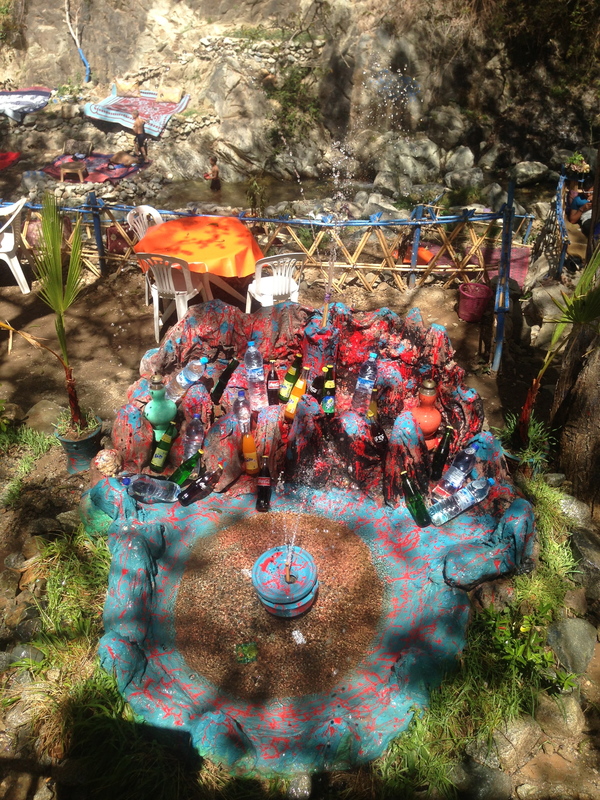 Cold snow-melt, running off the mountain keeps drinks cool in gaudy painted fountains. Once past the many blankets and little tables of stuff for sale the only way to continue was to hop across streams and climb over boulders. 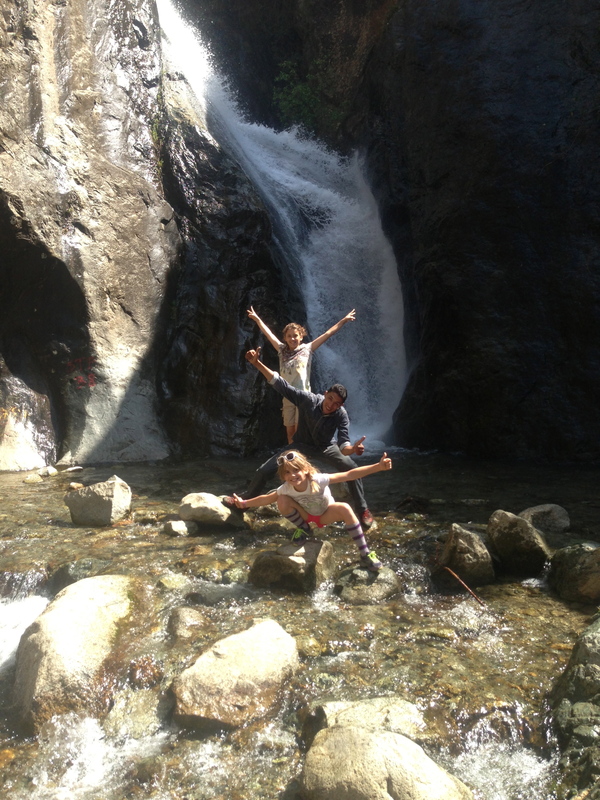 Now we were hiking! Mike and Savannah picking their way through the rocks. Mike is always sure to be behind just in case someone falls. What a view, see the village below? Moroccan goats can climb trees! 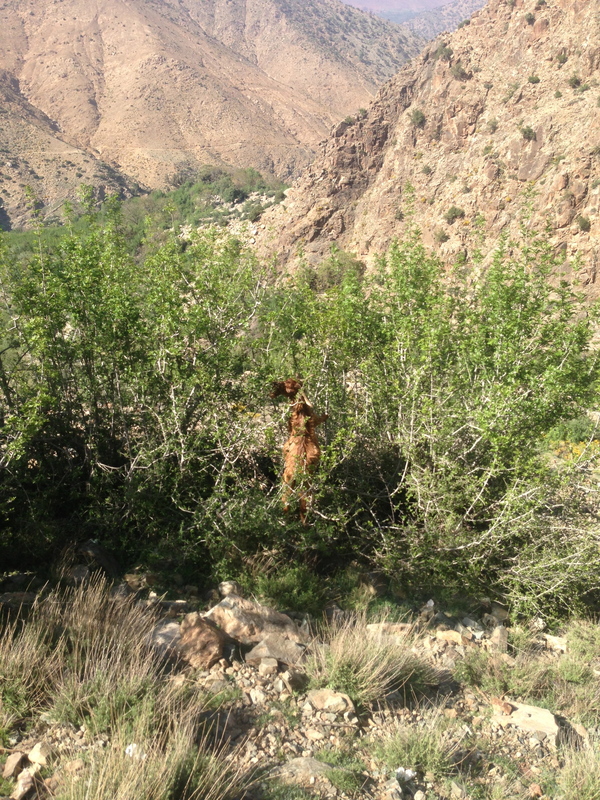 We came across one goat stuck in a tree. He cried until his shepherd could climb up and help him out. 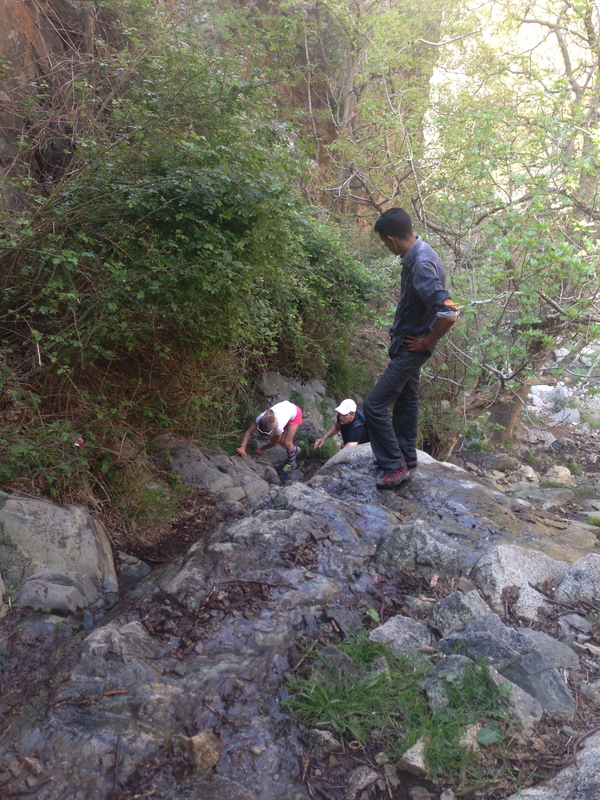 Jamal was a great guide, he was patient and clearly loved his job. He was in his element and let us know that getting paid to show foreigners his trails was a very cool gig for him. The views were breathtaking. 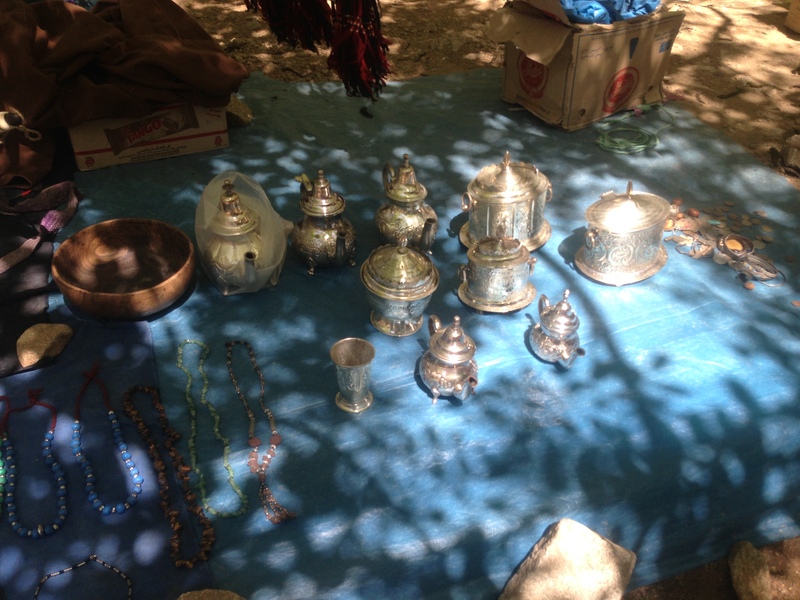 We hiked back to town through another gauntlet of vendors. 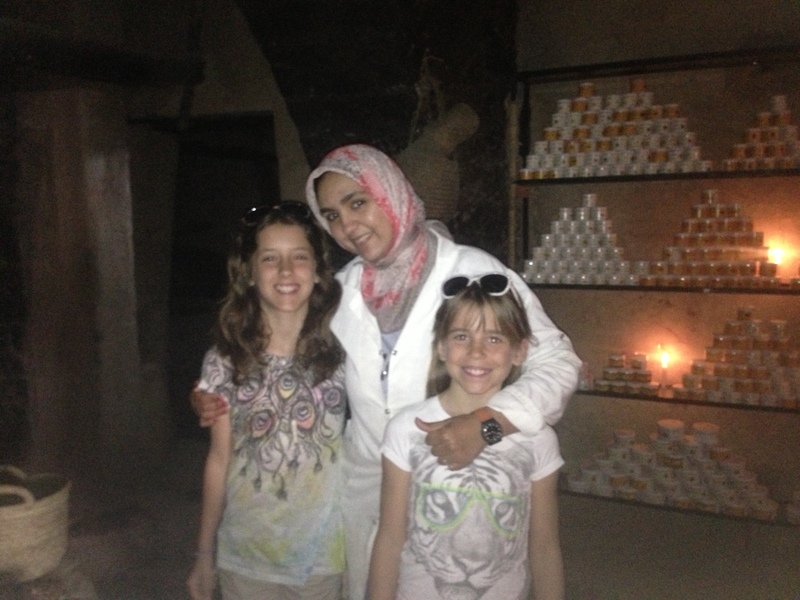 On the way down the hill I bought some “Moroccan Nutella”, a delicious mix of honey, almonds and Argan oil. 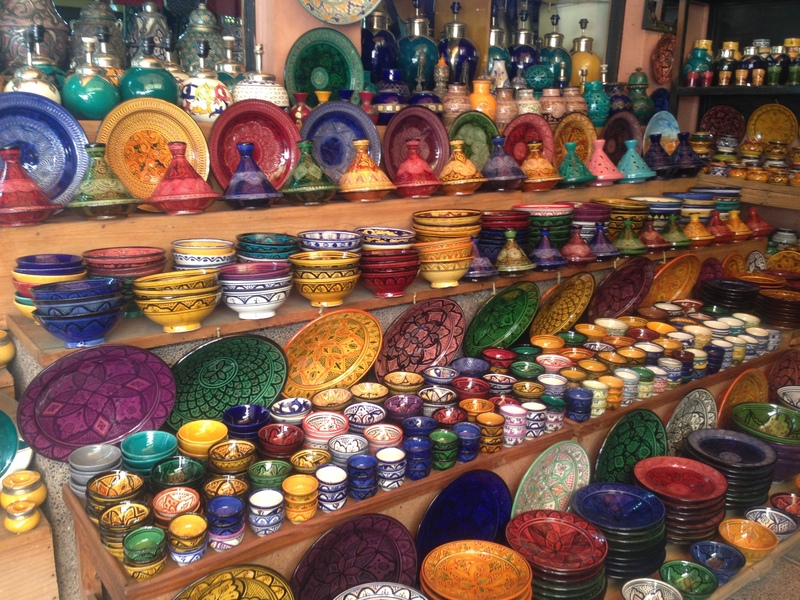 The trail actually cut through restaurants where earthenware tagines roasted over charcoal bricks. There were couches and chairs with plush, colorful pillows right on the back of the river. 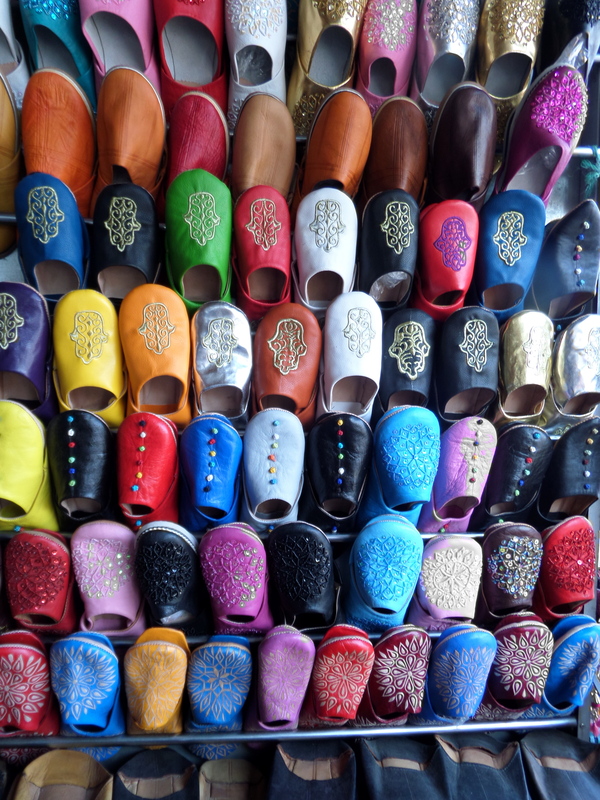 Tourists from all over the planet lounged and enjoyed the Moroccan sun or slept in the shade of brightly colored umbrellas. 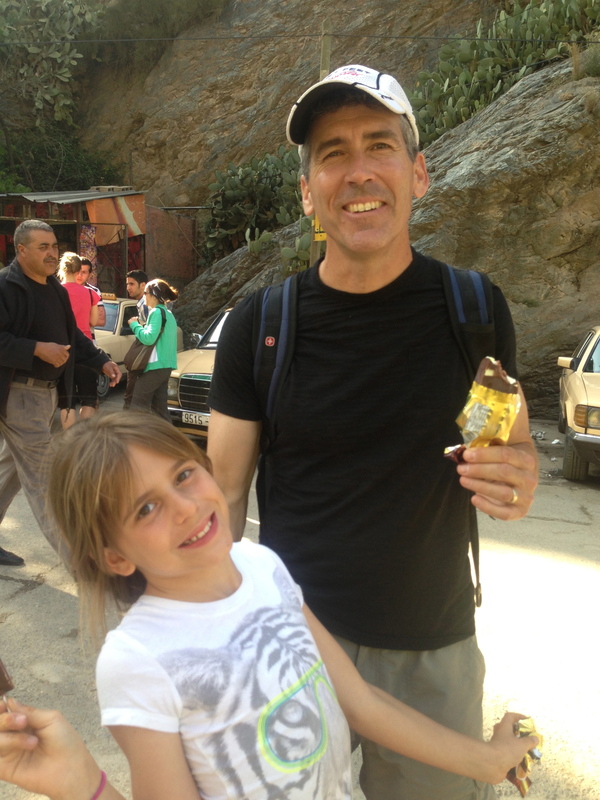 After the hike Mike and the girls had an ice cream reward. Back at the car Abdul was waiting for us. We settled in for the drive down the mountain back to the resort. 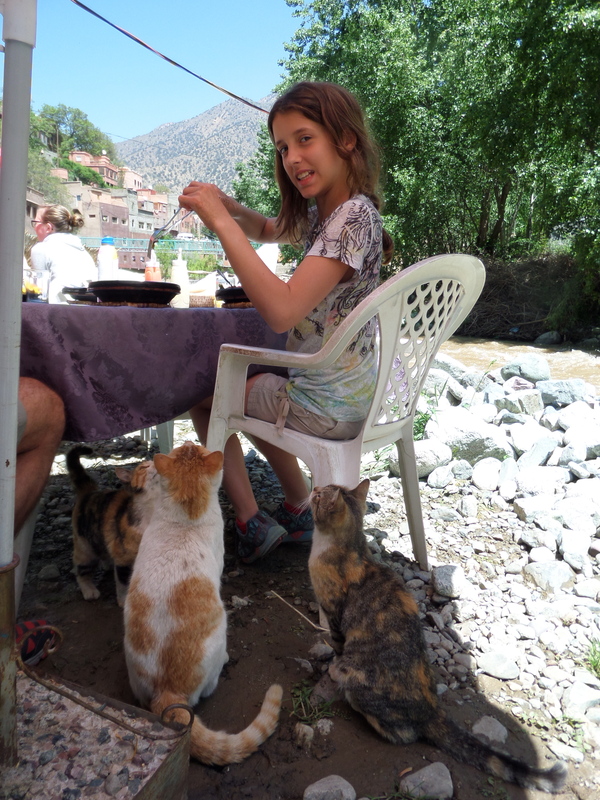 I didn’t feel like I had seen anything remotely near what life is like in a typical Berber village as promised by our guide. 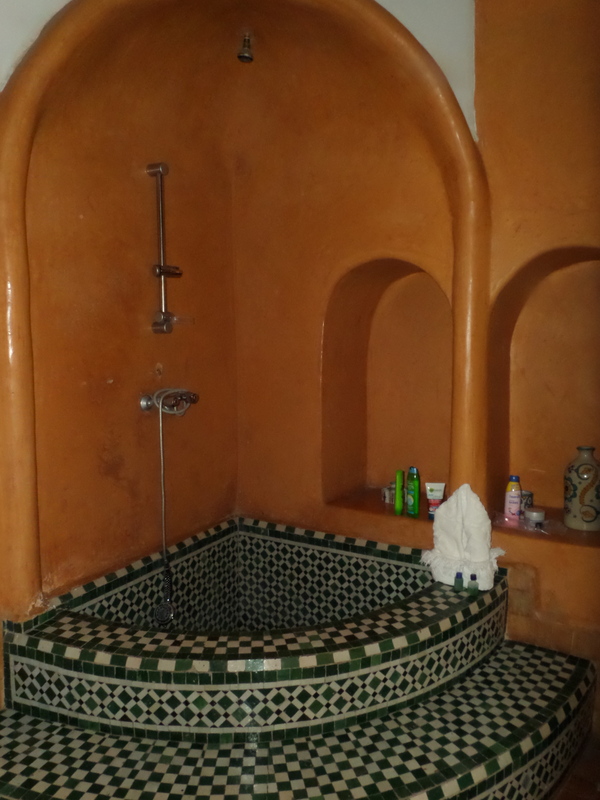 I did recall that a well traveled friend warned us that we were not going to see the real Morocco. 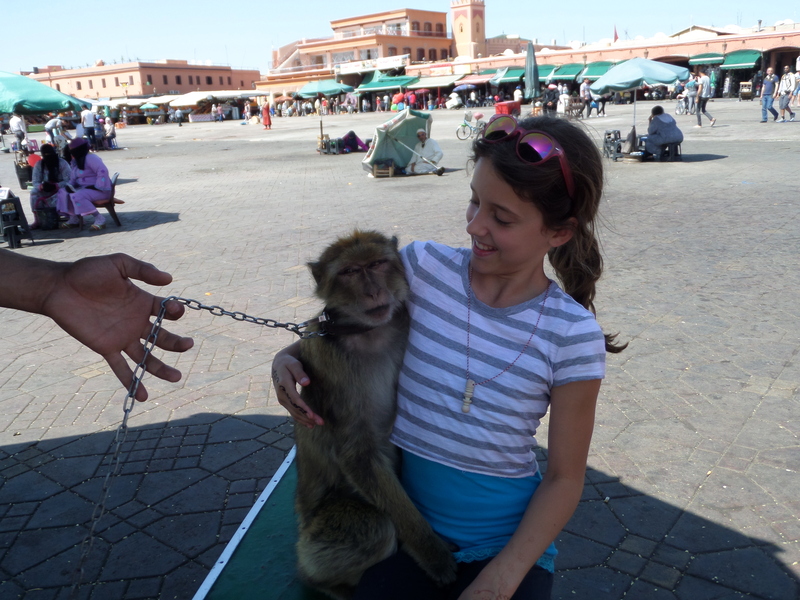 I am certain that she was correct but we did see the side of Morocco that has embraced visitors. 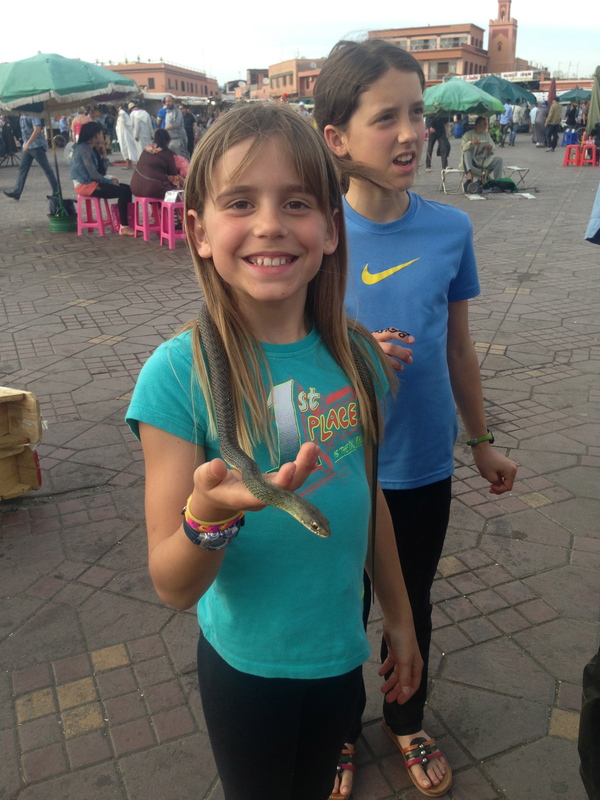 We didn’t see a single person that was unkind and everyone was genuinely welcoming, friendly and quick to share their culture. 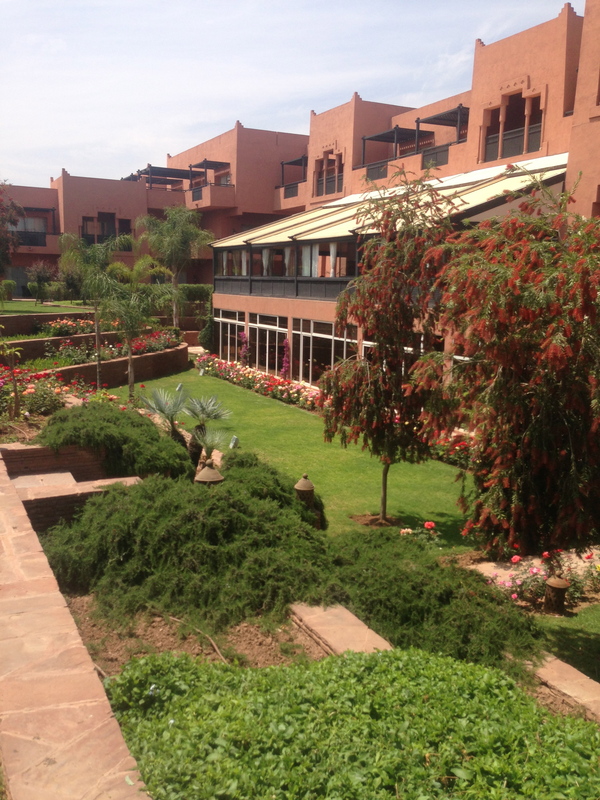 We spent our last day in Marrakech by the pool. We sat in the shade and I researched and wrote about our adventure. Sky and Savvy swam and met some lovely girls, Georgia and Lexi. 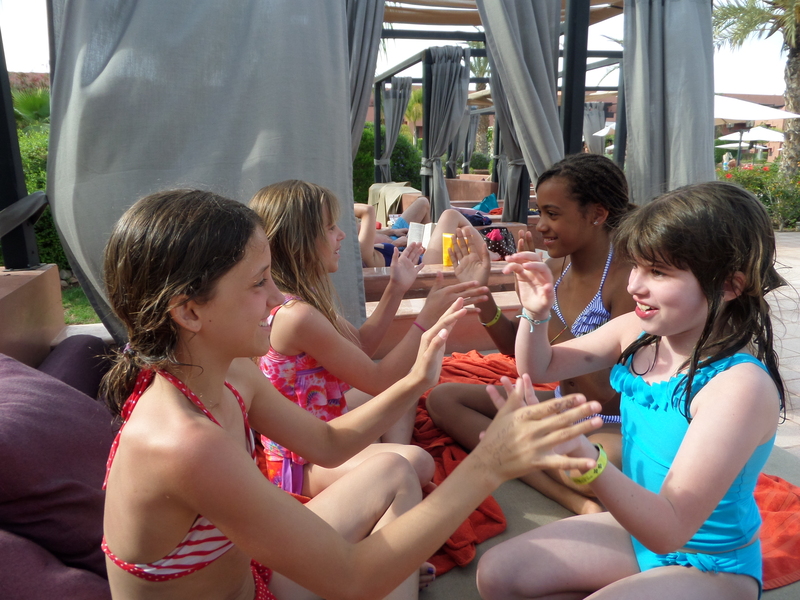 Little girls all over the world play hand games. They taught each other songs and will no doubt go home and share them with their friends. Best friends after a day in the sun! Our one selfie of the trip! 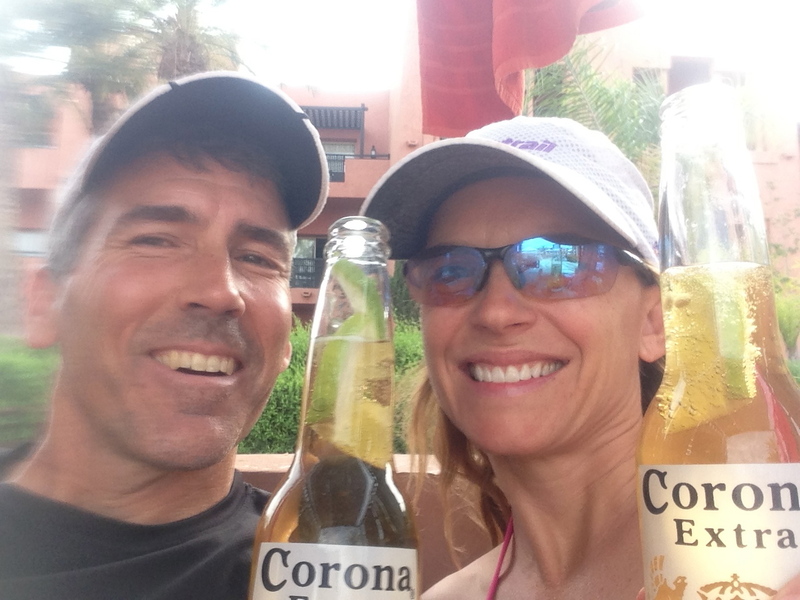 Coronas in Africa! 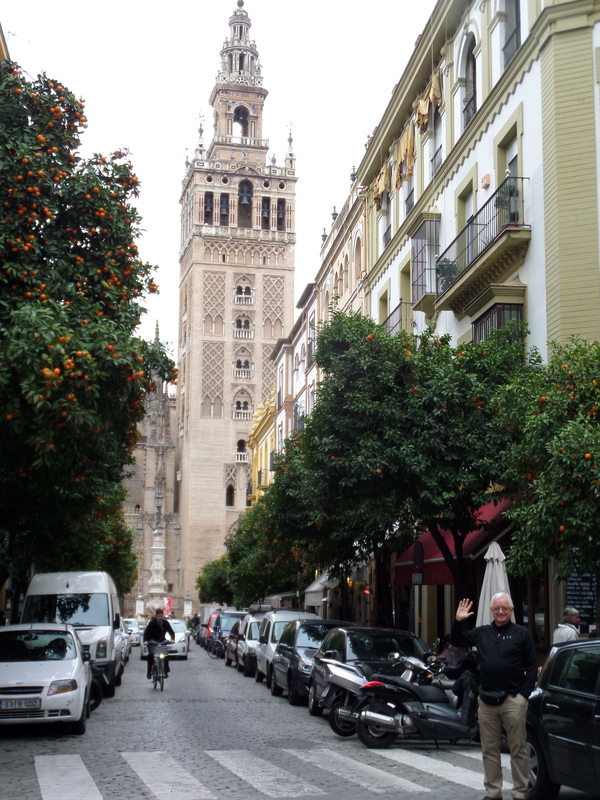 The next morning we flew back to Spain and when we got off the plane we all took a deep breath of Andalucía. Adventures are great but it also feels really good to get home! 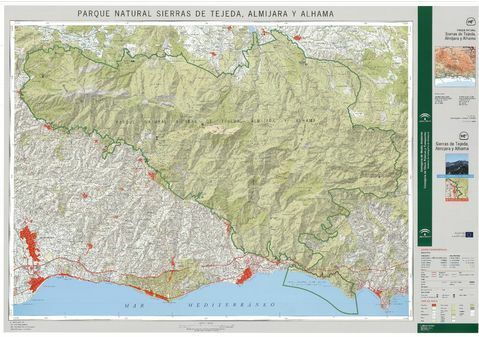 Mike and I have been wanting to run from our village of Alhama de Granada across the Sierras Tejeda y Almijara National Forest to the city of Nerja on the Mediterranean since we arrived in Spain. 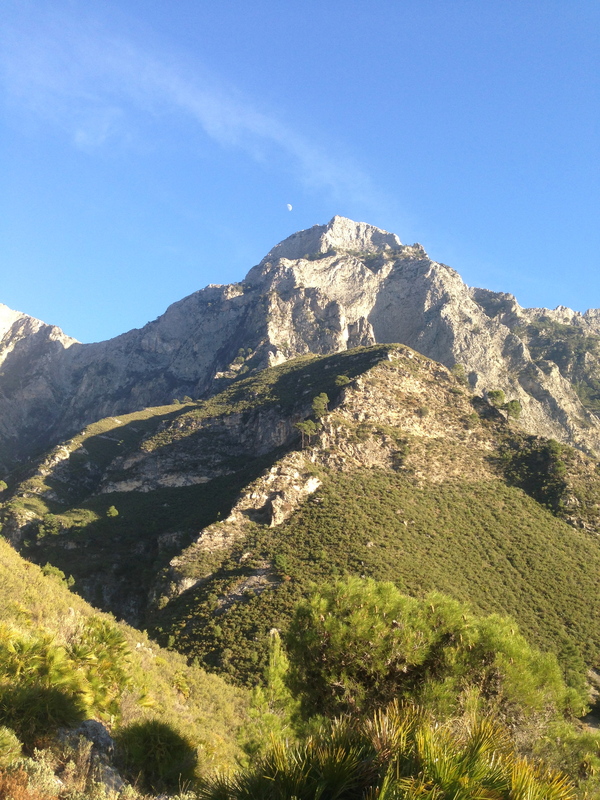 The Sierras Tejeda y Almijara is 406 km2 of beautiful, rugged, mountainous wilderness. 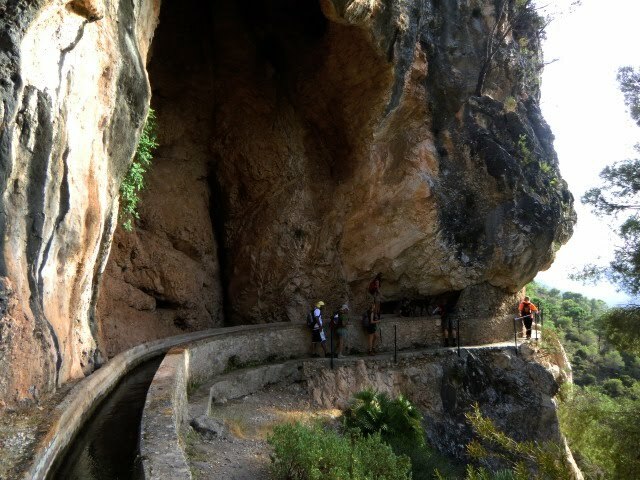 The national park divides Granada province, where we live, and Malaga province to the South. 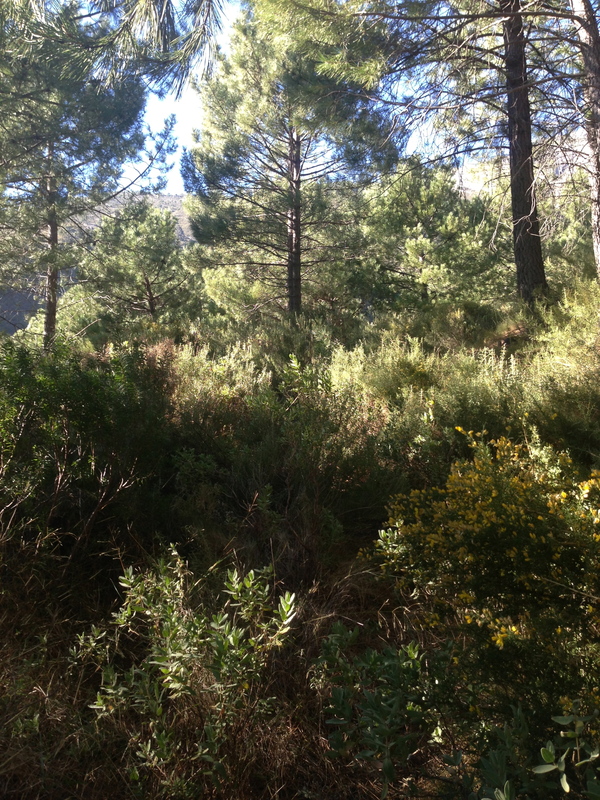 The mountains beckon us, we are drawn to explore the many trails that climb through the canyons under the shade of pine trees and the endless blue skies of Southern Spain. 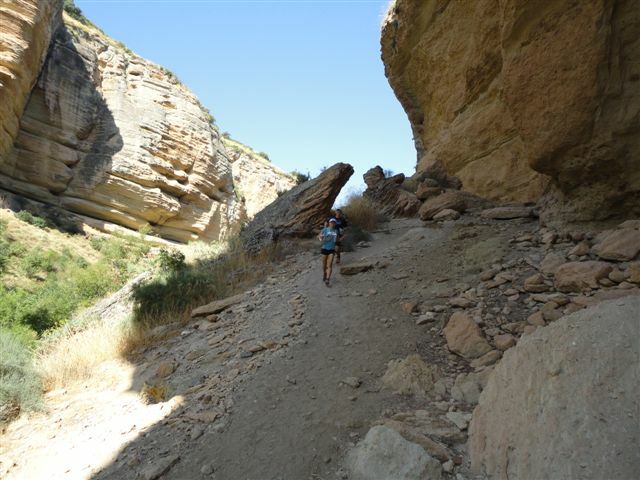 In the past few months we have spent many days exploring the trails on our side of the national park but despite our efforts we have covered only a very small fraction of the routes that are close to Alhama. 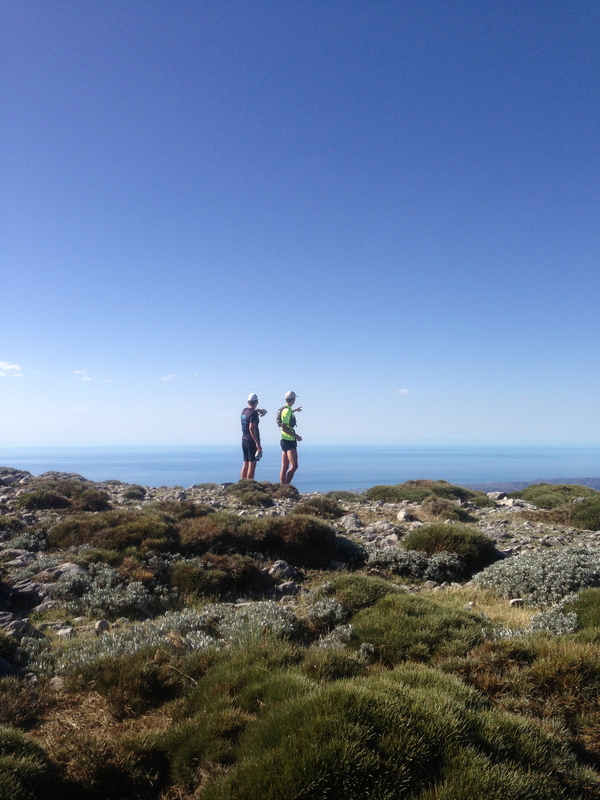 Whenever we reach points where we can see the Mediterranean in the distance we agree that if we can see it we need to run there! 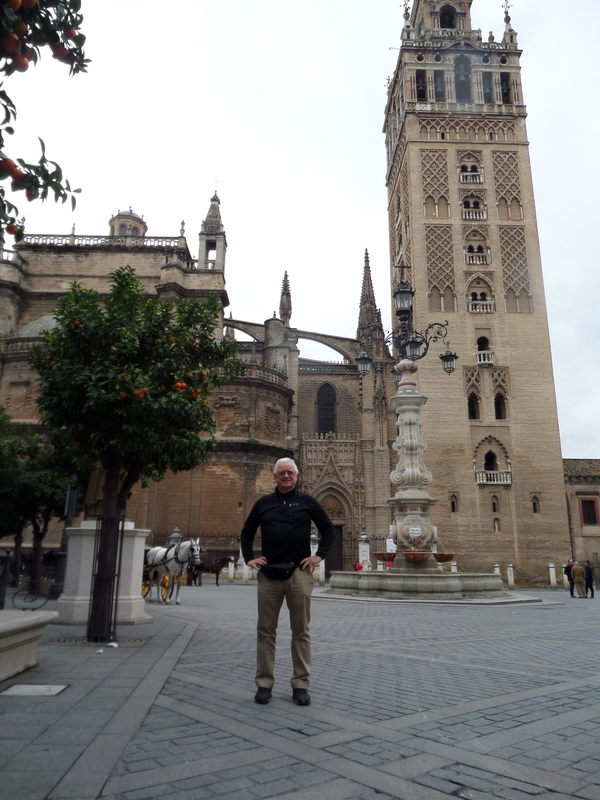 We consulted guide books, friends in Alhama and our friend Paul’s many maps of the region. We ran from La Resinera near the village of Forne several times scoping out the beginnings of the trek across the mountains. 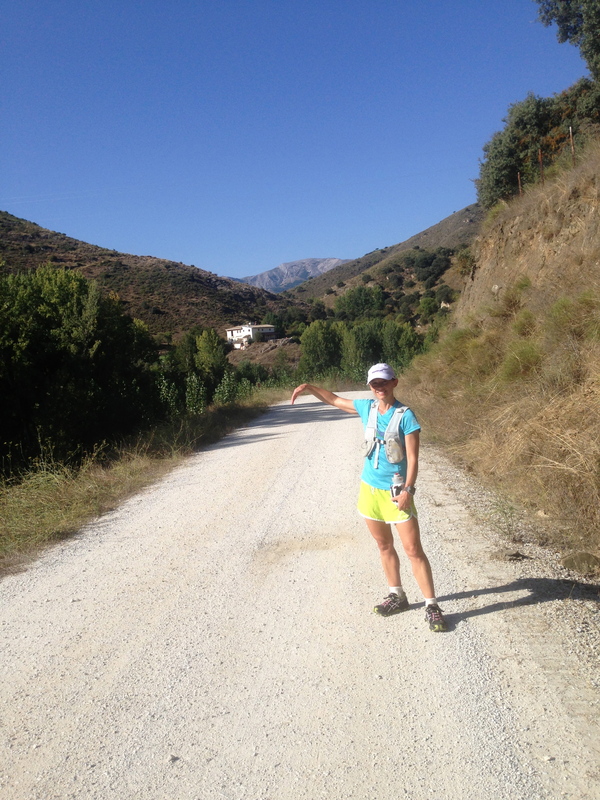 We knew that we could reach the Puerta de Frigiliana 7 miles up a nice dirt road from La Resinera office. From the Puerta de Frigiliana we could see the ocean and white villages on the opposite side of the park. How hard could it be to find a route down to the beach if we could see our destination? We recruited our friend Eric to run with us. 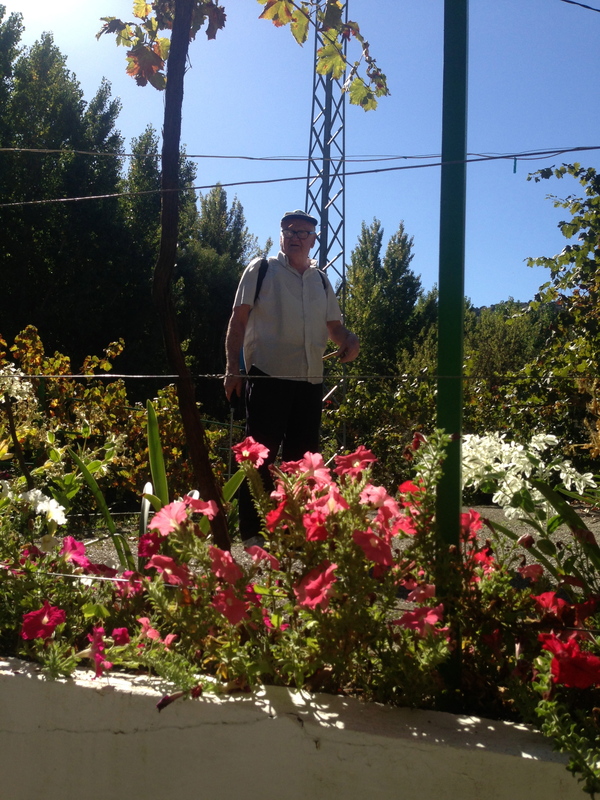 He has lived here for a few years and knows many routes on the Granada side of the mountain because he helps organize Al Andalus, ( alandalus-ut.com ) a 5 day, 230km trail stage race based in Alhama every July. This would be a new adventure for Eric since he had never attempted the route. He was excited to join us on the trek so our group became 3. The road from our side of the mountain was deceptively smooth. 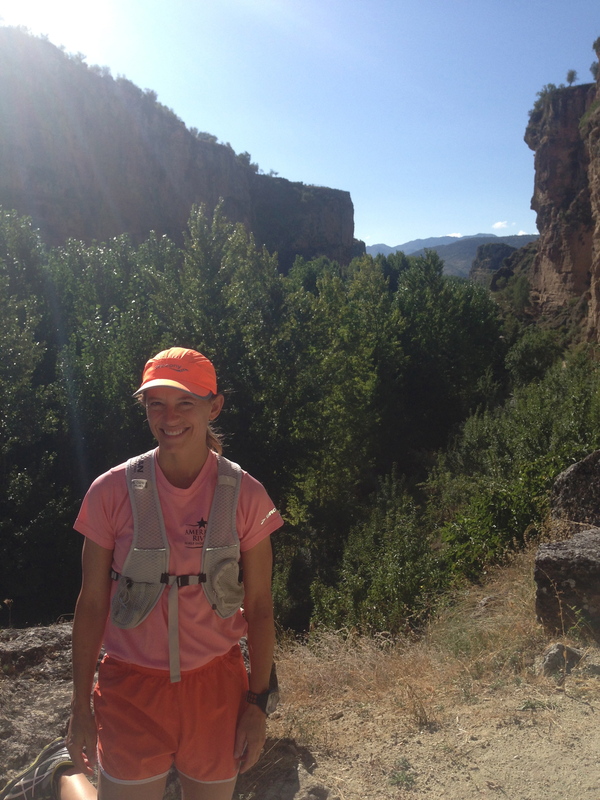 We had run to the Puerta de Frigliana many times and we knew that there was a excellent trail for at least the first 8 miles or so. From the Puerta we could see Lucero (1780meters/5840 feet). Fist bump at the top of a climb, almost time to start down! We continued the up the road which became progressively steeper and more rocky until we reached 5100 feet by my Garmin. 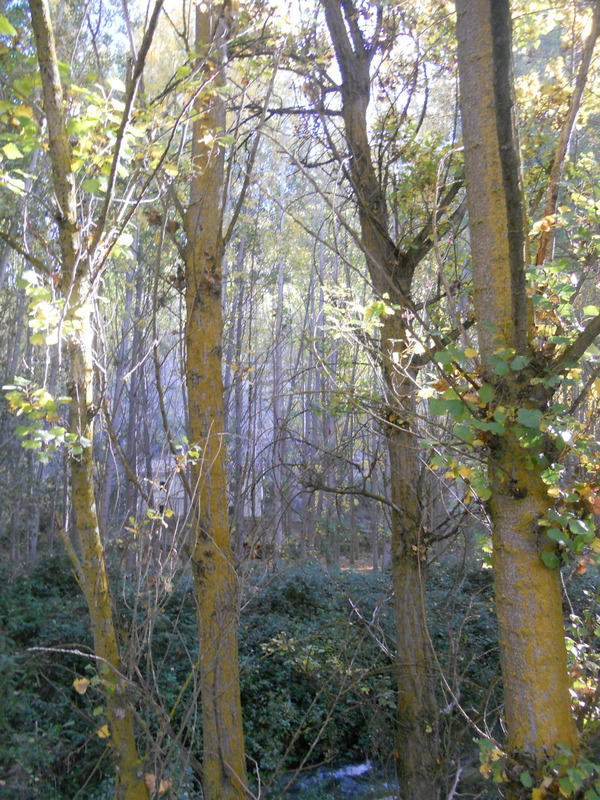 From there, the trail plunged downward and became more irregular. We carefully made our way to what appeared to be the end of the trail. We looked around and found a pile of rocks, a “cairn or duck” left by previous hikers to designate the direction to continue. From there the trail was quite overgrown. Oh dear, where is the trail? We imagined if there were people leaving rock piles it should really get better soon. We followed the trail squeezing between the various spiky bushes. After about a mile we were considering turning back. 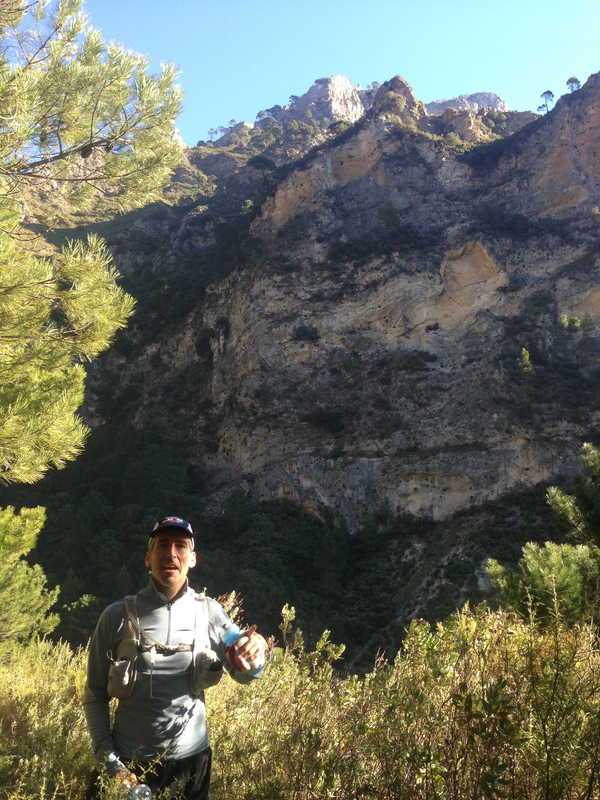 Just as I was about to agree that this trail was impassable Mike and Eric spotted El Cortijo de Inman a definite landmark on our map. 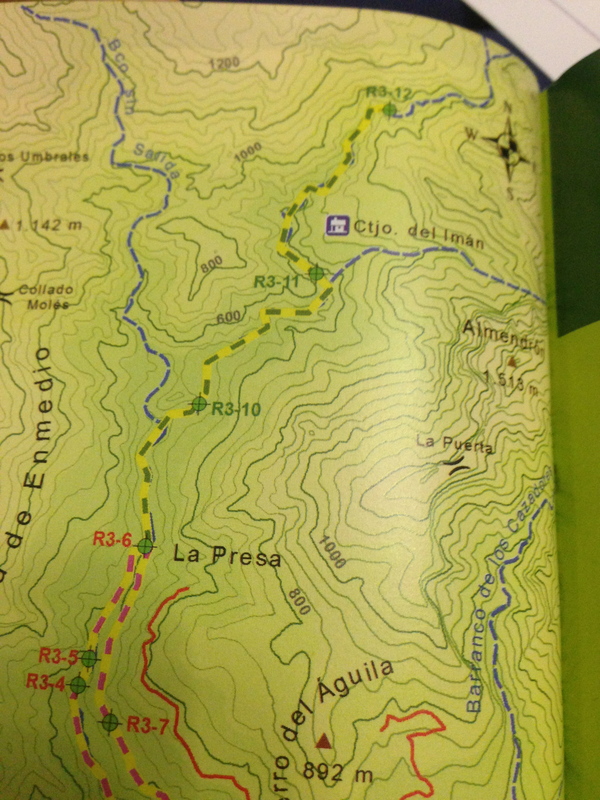 I had a picture on my phone of a map from my trail guide so we were sure that we were on the right trail. 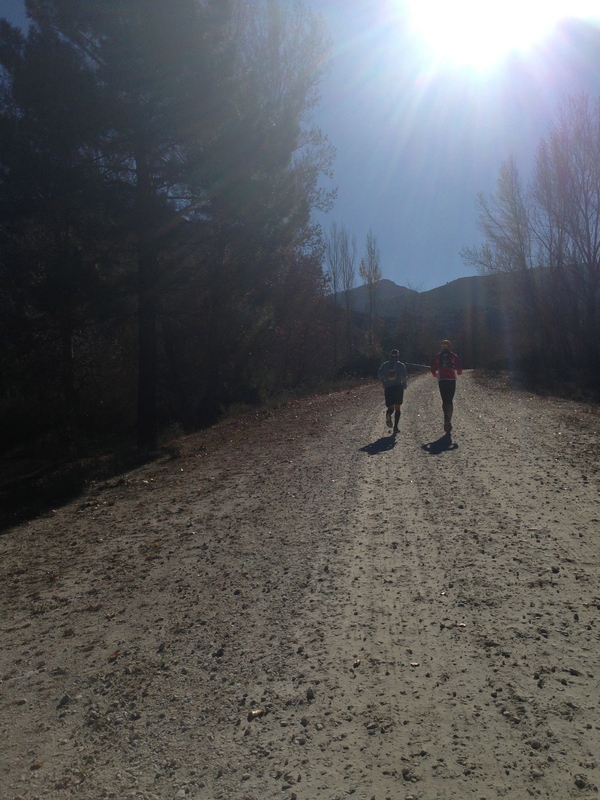 Surely after the Cortijo the trail would improve. Farmhouses, even in ruins, generally have a road of some kind leading to them. Eric scurried ahead of us and explored the ruins. 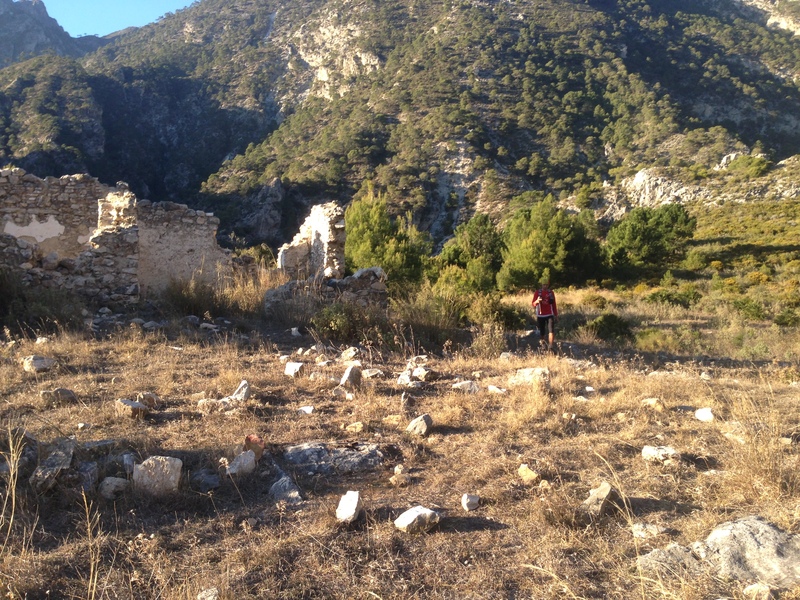 While he found plenty of evidence of previous visitors at the Cortijo, cigarette butts, water bottles, (even a pair of pants! ), we surveyed our scratches and looked for the next cairn. 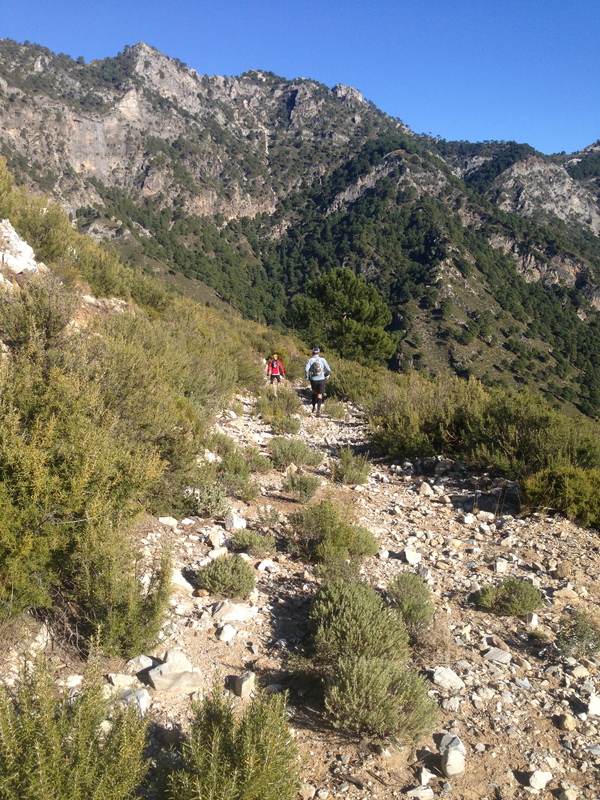 The trail leading away from the Cortijo de Inman was no better than the one we arrived on. We had now trudged through more than 3 miles of densely covered terrain and our legs were burning from the scratches (if only we had worn thick pants! ) so turning back was less than appealing. We found another rock pile and followed the trail down the canyon. At this point there were many dwarf palms which look quite pretty but have lethal spines. I accidentally grabbed a branch to move it out of the way and blood oozed through my glove. We started calling the dwarf palms the little palm trees from hell. “Be careful palm tree from hell on the left!” Amongst the various spiky plants were sage and rosemary. We learned quickly that rosemary is soft to touch so we would preferentially grab or lean on the rosemary branches to squeeze past their dangerous neighbors. Although bloody, my gloves smelled lovely at the end. After an eternity of moving very slowly through overgrowth above my head in many places we came upon La Presa, a dam that was clearly marked on our map. The dam was very old and long since abandoned. 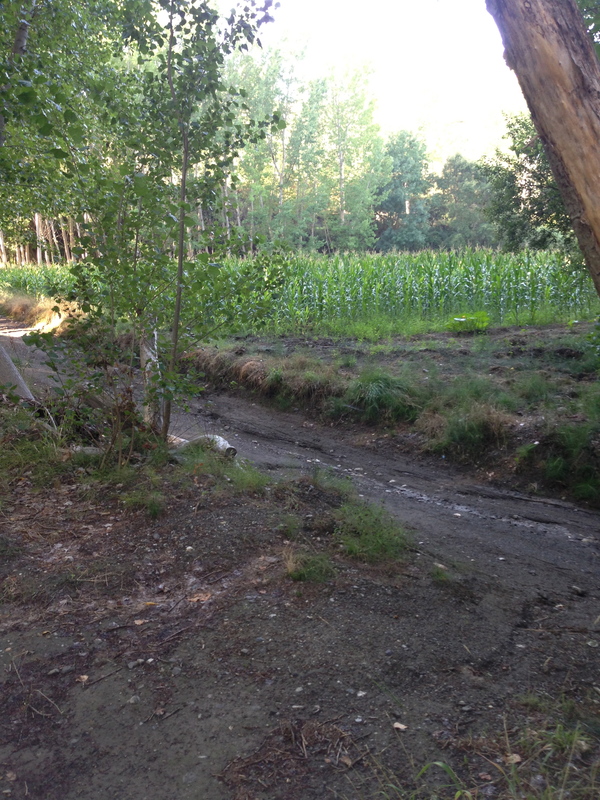 There was an acequia, an aqueduct, that was for the most part, intact. 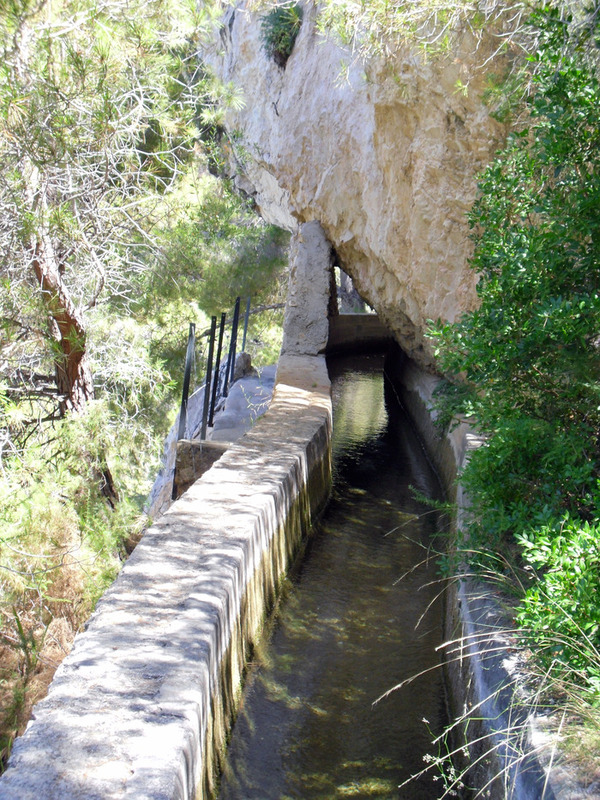 Our guide book recommended walking along the aqueduct as long as “vertigo is not a problem”. Actually Mike read that part of the book and let us know that for the next few kilometers it would be wise if we just paid attention to our footing. If we wanted to look around it might be best that we all stopped in a wide spot. Unfortunately we could see the sun slipping more quickly toward the horizon and we started to get really nervous that we were going to be out on an unfamiliar trail well beyond nightfall. As dusk began to fall, we walked as quickly as we could manage safely along the side of the aqueduct which was about 12-18 inches wide and very uneven in places. In many spots there were holes big enough to fall through. 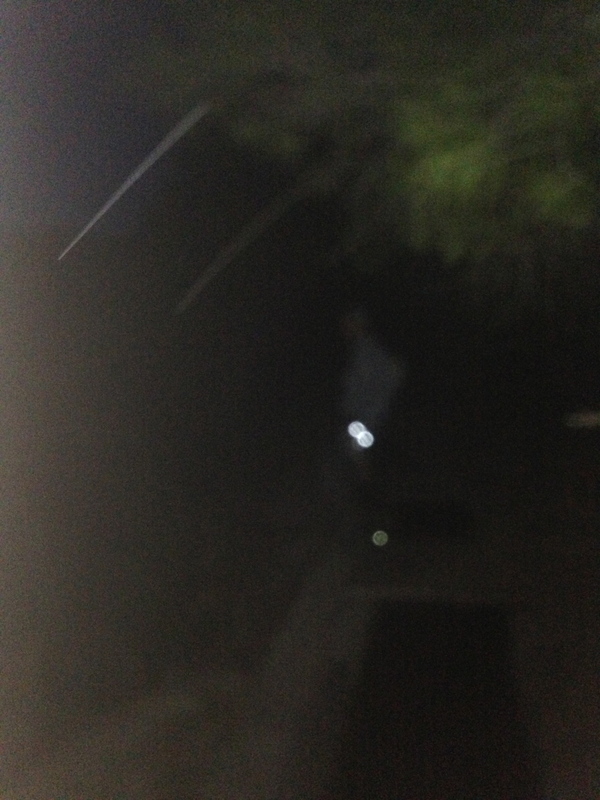 As it got darker I would call out irregularities to Mike and Eric behind me. We were needing to stop to eat but were afraid to waste even a moment of daylight not moving forward. 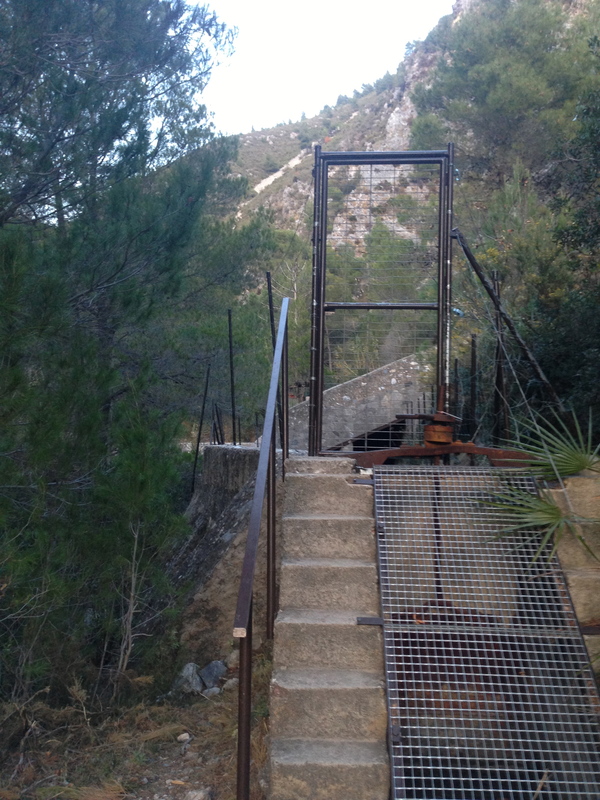 Eventually the narrow walkway became very difficult to see and I started to feel panicky. What if one of us slips and falls over the side? At this point we couldn’t even see when it plunged sharply over a cliff. Occasionally there would be a thin wire stretched along the side. Another picture from the internet. When we passed this spot it was dark and we couldn’t see the drop off! I don’t know who the people are. We could no longer see but had to assume if there was a wire railing that it was a more precarious section. We were careful not to put any faith at all in the tiny guide wires. It was unlikely if we fell that that wire would hold any of our weight. I pulled out my Iphone and used it for about 50 meters until Mike suggested that we try his flashlight. He had brought a multi-tool that had a knife and a flashlight. He thought the light would not be strong enough to guide us but as it turned out I think it probably saved our lives or at least prevented us from losing the trail in the dark. He took the lead and held the light so that it shone in front of him but also a bit behind so that we could follow. We moved very slowly and deliberately for another 30 minutes until we started to hear the sound of a waterfall. In the dark the sound of crashing water over a cliff was a bit more terrifying than usual. It was then that I remembered that the guide book recommended bringing a bathing suit for a nice, refreshing dip in the water. In December, in the dark, with the chill of night closing in we did not want to get wet. Mike announced we were stopping and warned us that we were going to need to go through the water. We had reached the end of the acequia and to get past where it plummeted into the darkness were were going to need to walk through the water for about 20 feet. Mike carefully tested the surface under the water with his left foot. We had to walk along the edge of the waterfall. If the cement was slippery this would be very dangerous. Thankfully the water was only up to our knees and the pavement wasn’t slippery. We all held hands and slowly, deliberately, took very small steps until we reached safe ground. I was shivering when we emerged from the water. I wasn’t sure if it was from the cold or from the fear that I was trying to keep under control. We had been worried for at least an hour that we could be going in the wrong direction but at this point we could see the lights of Nerja and we ventured a mini celebration and stopped for a small snack. 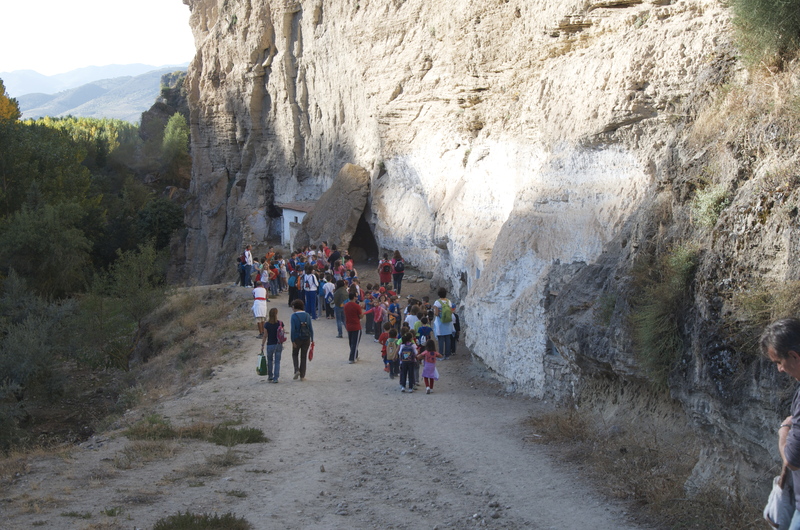 When we emerged from the acequia there was a narrow, rocky path that switched back and forth down the side of the mountain in the general direction of the lights. We stayed close together and moved slowly through the dark. We finally came to what appeared to be a very old electrical station. Horray, surely there will be a road from there! OK, so no road but there was a sign with an arrow indicating “dirección obligatorio”, obligatory direction. Again, we were really grateful for the flashlight without it we might have missed the sign. We didn’t find out what was in the other direction but if someone went to the trouble to put up a sign like that it wasn’t anything good. 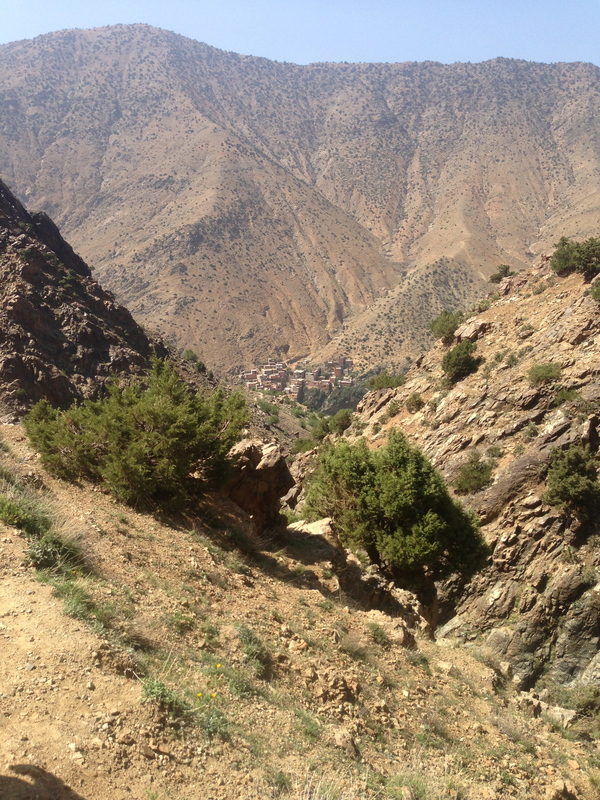 The obligatory direction path sent us straight down an even steeper, twisty, rocky path. We had been traversing the side of the mountain on the aqueduct so we were happy to be moving toward sea level but wouldn’t have minded a bit more gentle descent. The rocks were uneven and mobile and we each took at least one slip onto our backsides. Between slips Eric’s phone rang, ahh cell service! Michelle was calling, worried that she would be late meeting us. 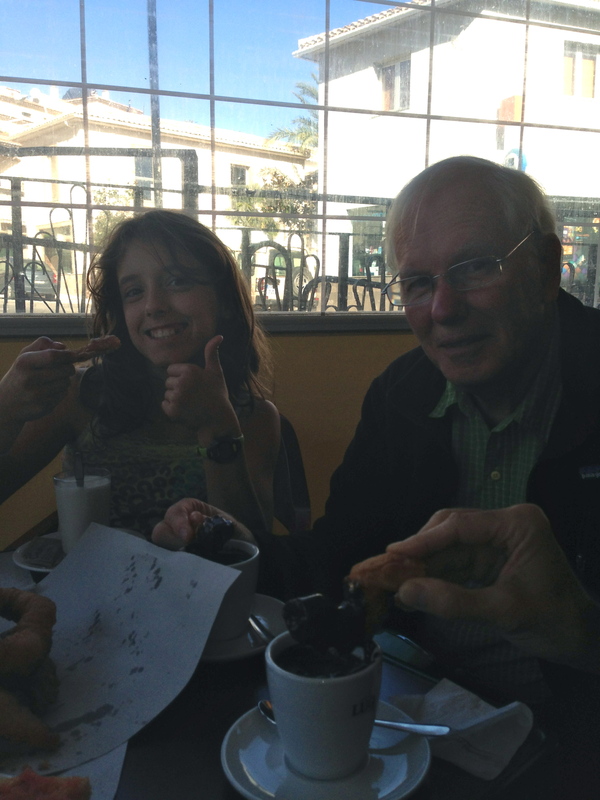 He assured her that we were OK but it would probably still be awhile before we would meet her in Nerja. We finally reached flat ground and found ourselves at the Rio Chillar which, likely due to the drought was little more than a very wide creek. We could no longer see anything resembling a trail but now that we were out of the trees the moon was shining brightly just over our destination. It seemed to be there just for us to guide us to warmth and safety. The moon was 3/4 full, a gibbous moon, it shone on the white rocks and illuminated the path. Our shoes already wet, we cheerfully bounced over rocks and through the water. We reflected that it was a huge relief to be on solid ground where if we fell it would only be to the ground under our very own feet, not 100’s of feet below. 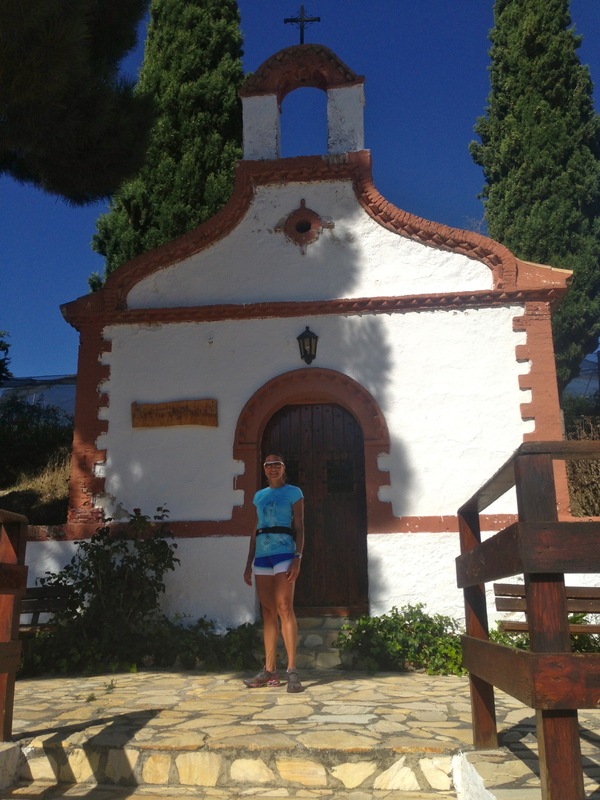 The rio led us to a dirt road that crossed under the freeway and eventually to a road that lead us up to a residential neighborhood in Nerja. 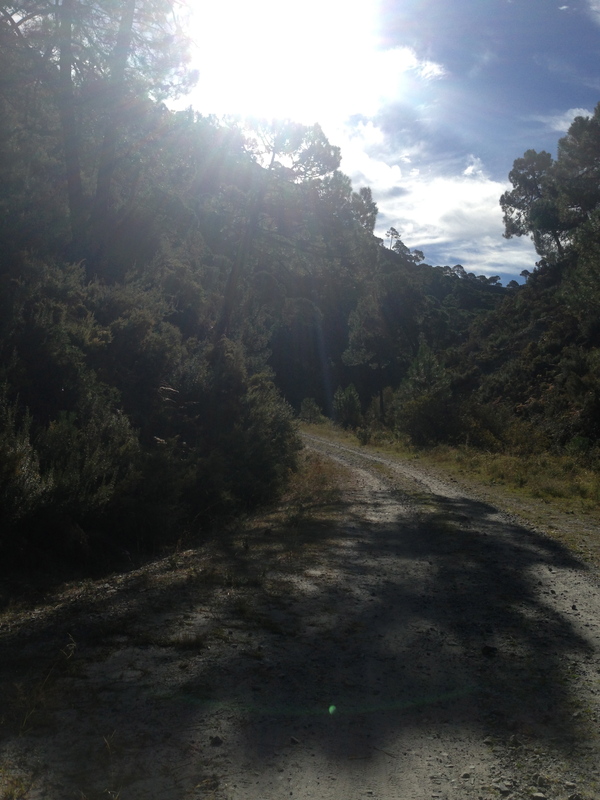 I love running in the mountains and I am never happier than when I am in the forest with soft dirt beneath my feet, but let me tell you, I was so happy to see the pavement that night! Mike, Eric and I whooped with joy as we ran down a familiar road to the hotel. We were actually able to RUN and it felt so good after so many hours of tense hiking. It was hard to believe that the first half of the adventure took 2 1/2 hours while the second half took 6! 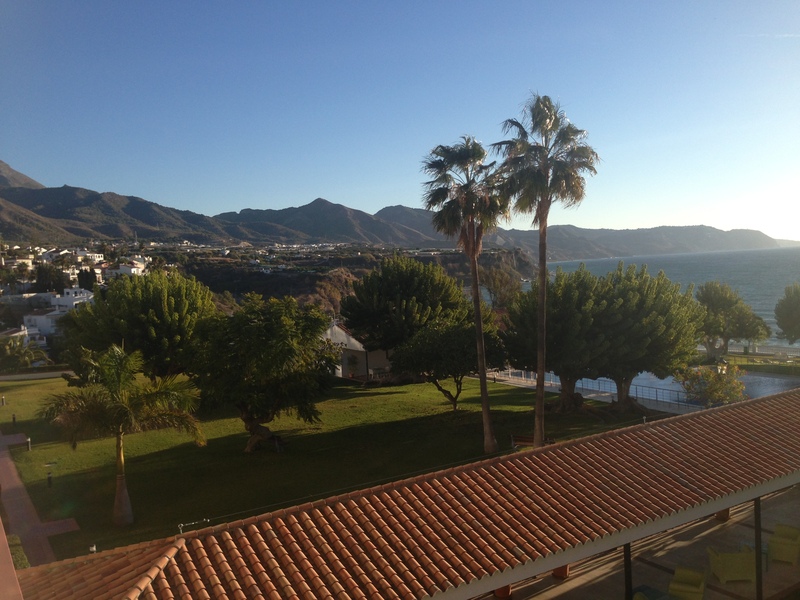 I had reserved a room at the Paradores de Nerja, a very posh spot right on the beach. Michelle came out to take our picture. We can still stand on one leg! Nerja, a beach town, is a ghost town in December so the price was right. We were very dirty, our legs were bleeding and we probably didn’t smell very good but the lovely people at this very fancy hotel welcomed us with curious smiles. Michelle was waiting for us in the lobby with bags of warm clothes. She was calmly working on her computer using the hotel’s “abierto” wifi. She hugged us, ignoring the sweat as we excitedly recounted the past few hours. I am pretty sure we were all talking at once we were so excited and relieved to be standing in the lobby of a a 4 star hotel! We checked in, showered and in no time were in search of food. We had eaten breakfast but that was many hours ago and 8 hours of running/hiking on only energy gels and granola bars left us starving. Amazingly we found a wonderful Indian restaurant. We ordered a bottle of the house wine because the waiter told us that it was special Indian wine from Argentina. What an international day we were having! We talked and laughed and ate and ate. 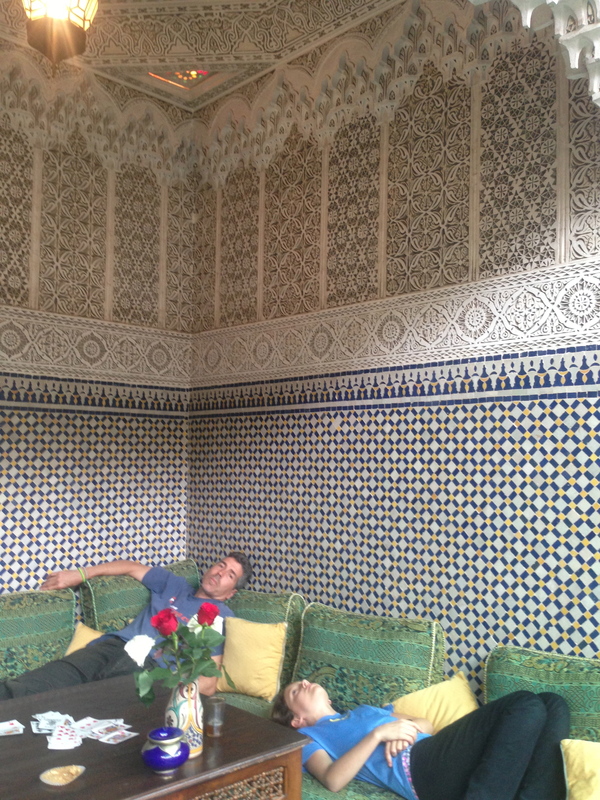 We slept hard at the Parador that night. In the morning I awoke to the sound of the mediterranean outside our window. 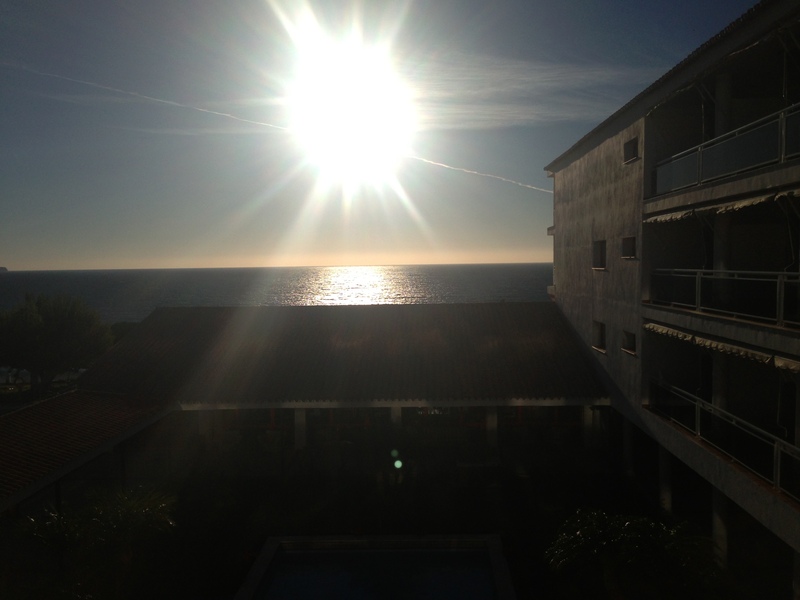 The Parador is on the beach and the view from our room was breathtaking. 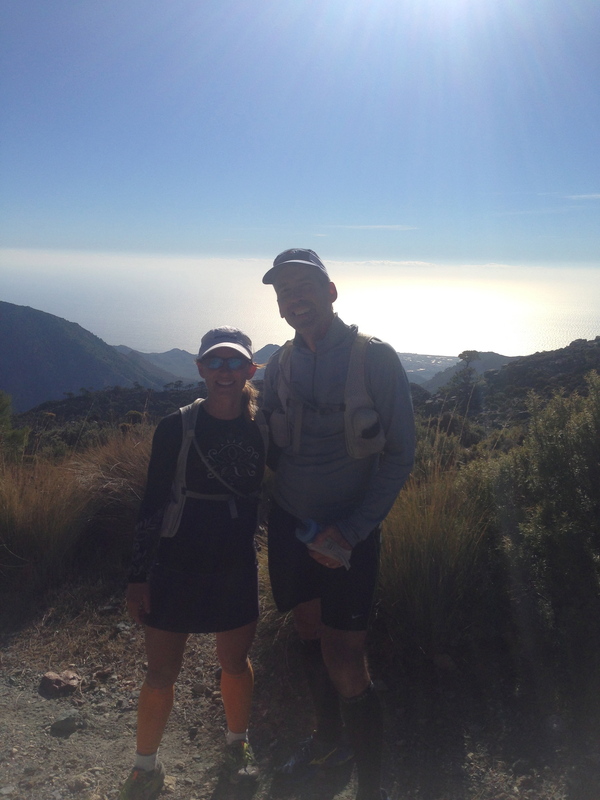 Our original plan was to run back to La Resinera the day after our trek to Nerja but even in the daylight repeating that trail was not on our list of fun adventures. 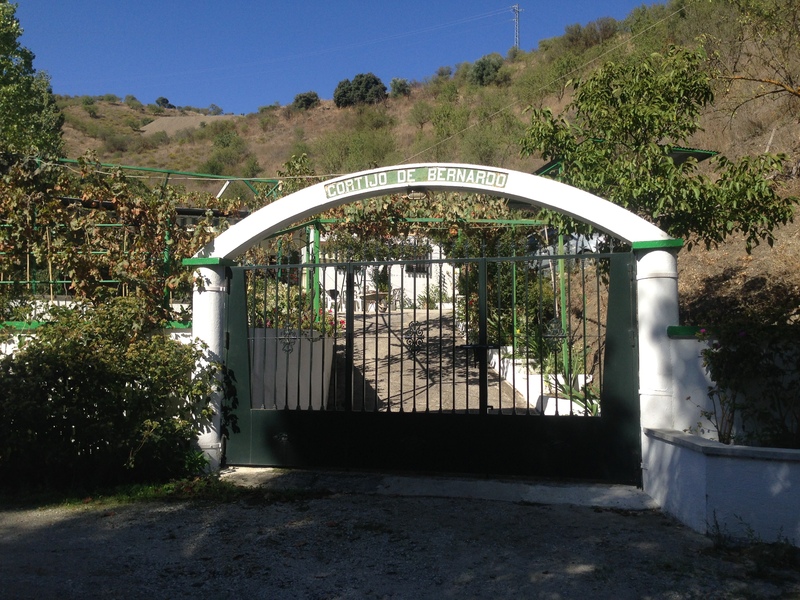 One time past the Cortijo de Inman and along the acequia was enough for us! 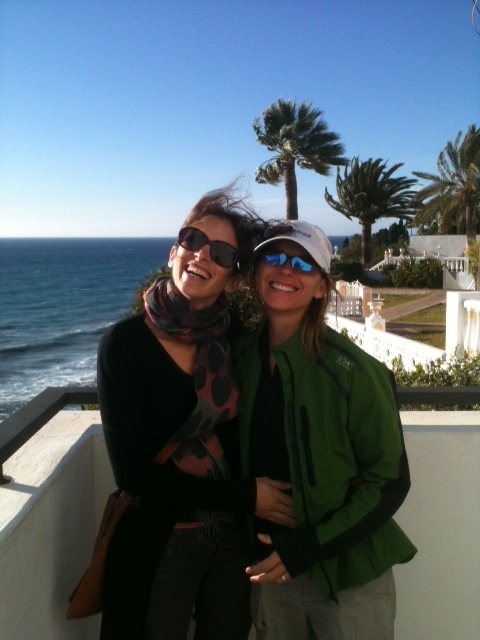 What luck Michelle had opted to drive to Nerja to meet us! The runners in the morning. It was important to touch the water! Eric and Michelle drove us back to our car by way of (of all things!) a McDonalds. How happy Mike looked eating his quarter pounder and french fries. We made it home in time to pick up the girls from school. I hugged them hard and promised myself that our next adventure would include more running and less danger. My leg at home the next day. Mike made me include this! 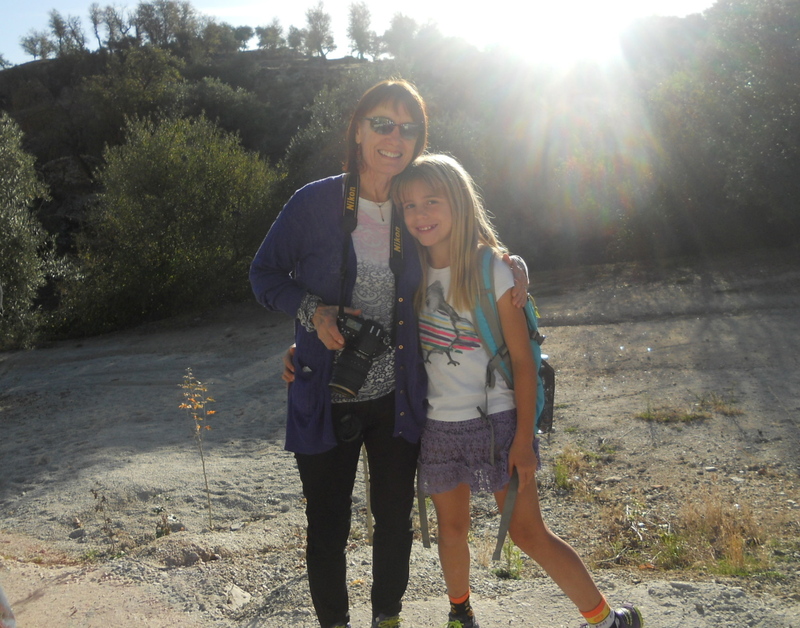 Last week we had our first brave visitors to Alhama de Granada. My mom and stepdad, Dave came to visit for my birthday. Team Kezmoh drove our Seat Leon to Malaga to pick them up. We returned the little car and exchanged it for a minivan for the week. A minivan is a rarity in Spain because large vehicles are not meant for Spain. The roads are narrow and parking spaces are very tiny. At the airport Mike took care of the details of switching cars while Sky, Savvy and I planted ourselves outside of customs. We were overjoyed when we spotted Grammy Sandi and Grampy Dave! We gave them huge hugs and led them to the minivan. 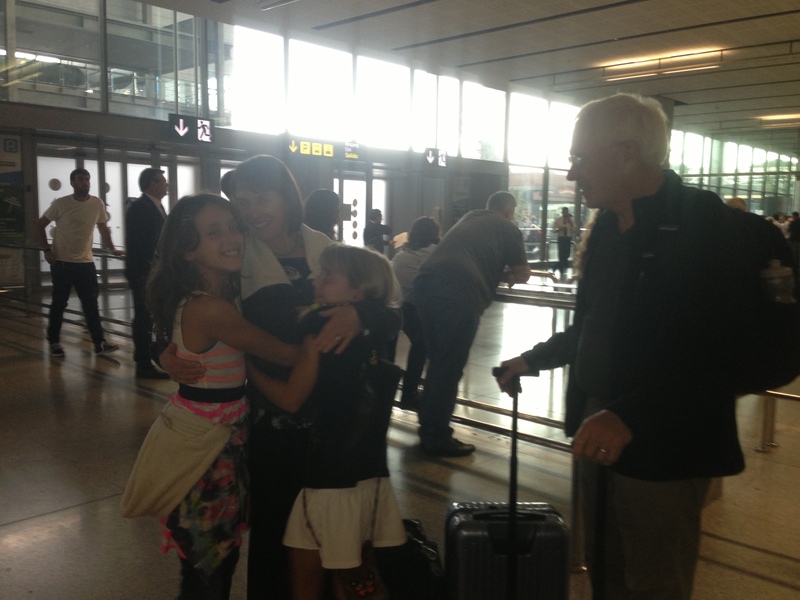 So glad to see Grammy and Grampy! 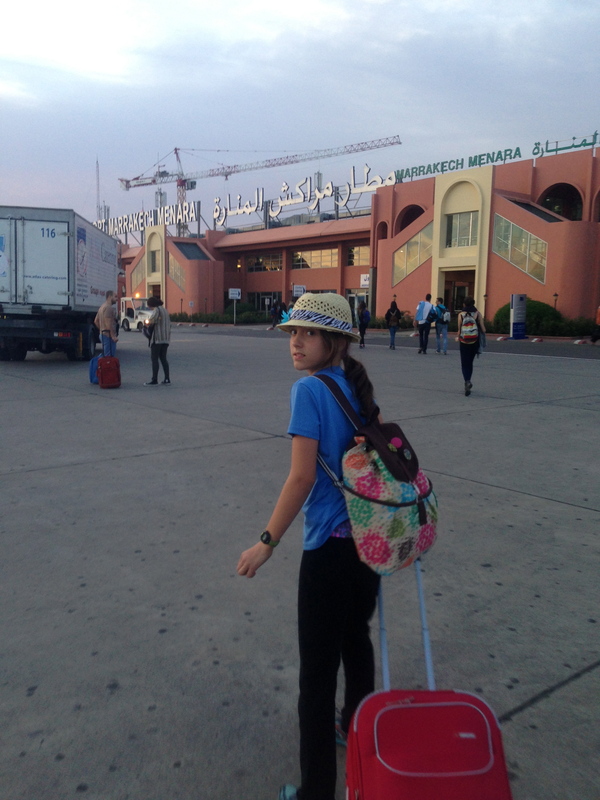 The girls chattered all the way to Alhama about their new lives here. 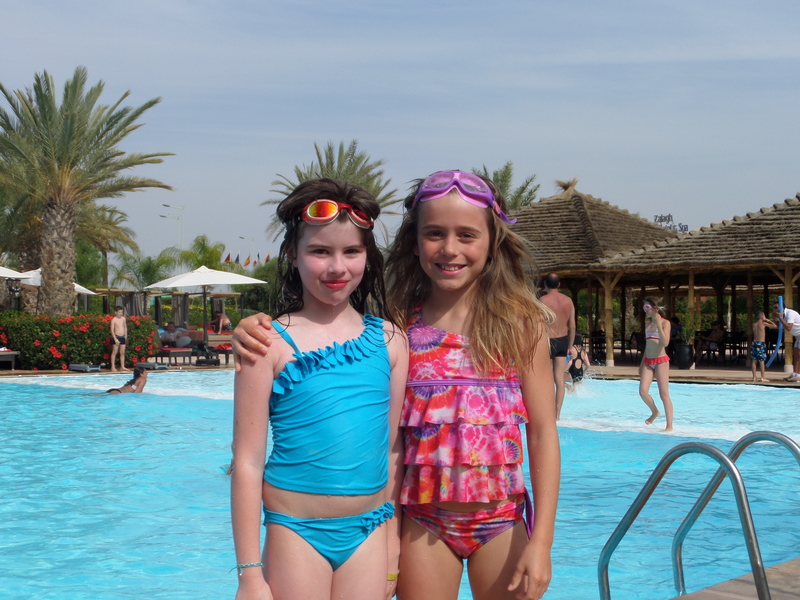 While our special visitors settled into the apartment downstairs (Apartamentos Salmerones), Savannah made a list of the important sites she wanted to share in Alhama. We hardly gave Mom and Dave time to put their suitcases away before they were pulled out the door for a tour. Savvy had her list so she was our guide. 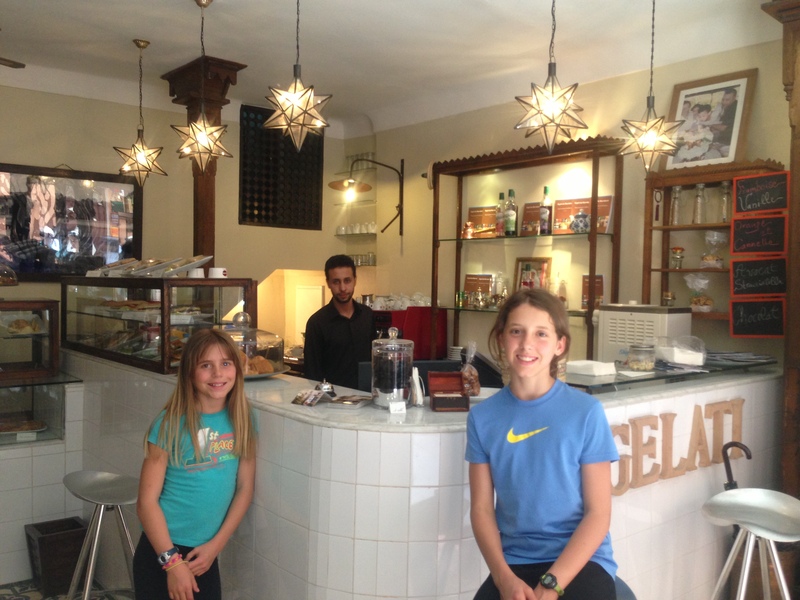 We visited all of the important parks, the library, the grocery store, the Churrero, the coffee shop and the school. Looking back I had to smile because Alhama has many tourists who pass through every day. I always see them disappearing on hikes into the gorge, touring the old quarter, and posing for photos in front of the old church but I bet none of them knows where the grocery store is! 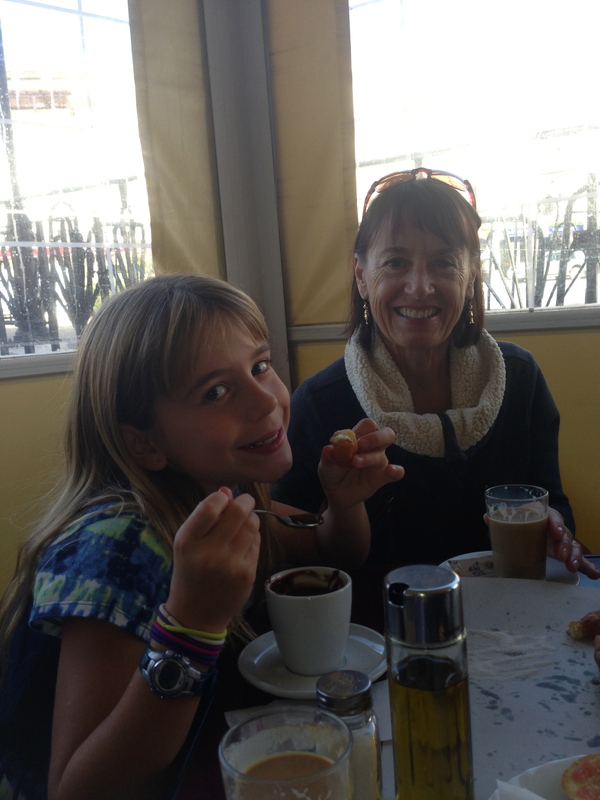 On Sunday morning we hiked down to the Churrero for churros and chocolate, a must for visitors to Spain. The churros are made fresh when ordered and “churros for 6” is enough for an army. The chocolate is a thick molten pudding rather than a drink and it is served with a spoon. 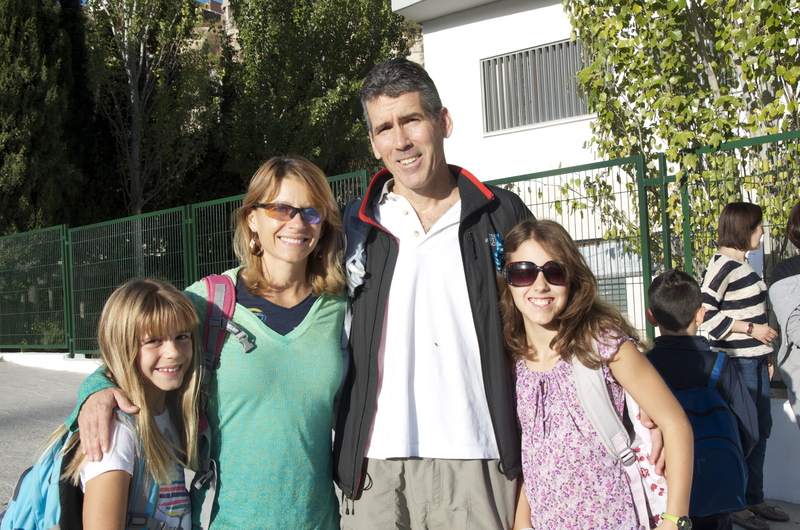 Luckily for Mom and Dave we had an all-school, all-day excursion on Monday! 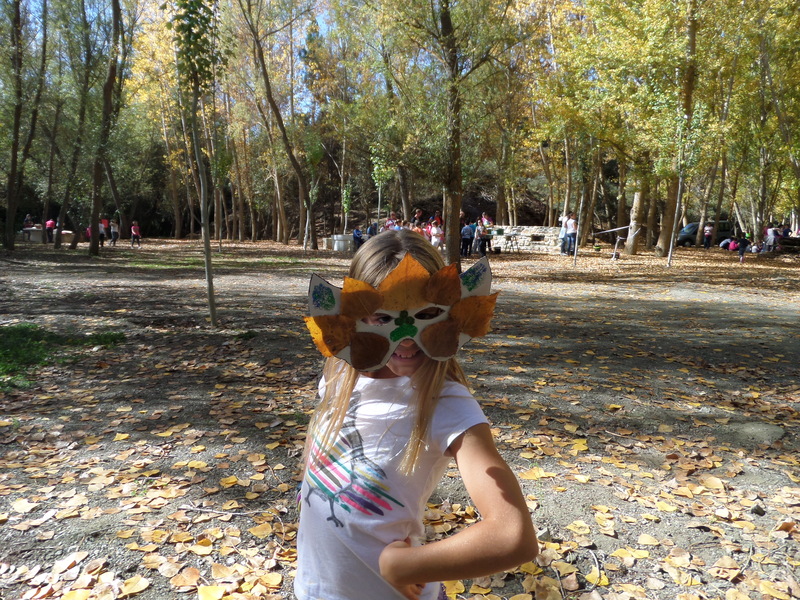 It was an “Excursion al Campo”, a trip to the countryside. Sky, ready for the outing! The week before Mike and I had been recruited to help brainstorm activities for the day. It was Halloween week so they wanted us to help with ideas from our Halloween/Harvest festivals at home. 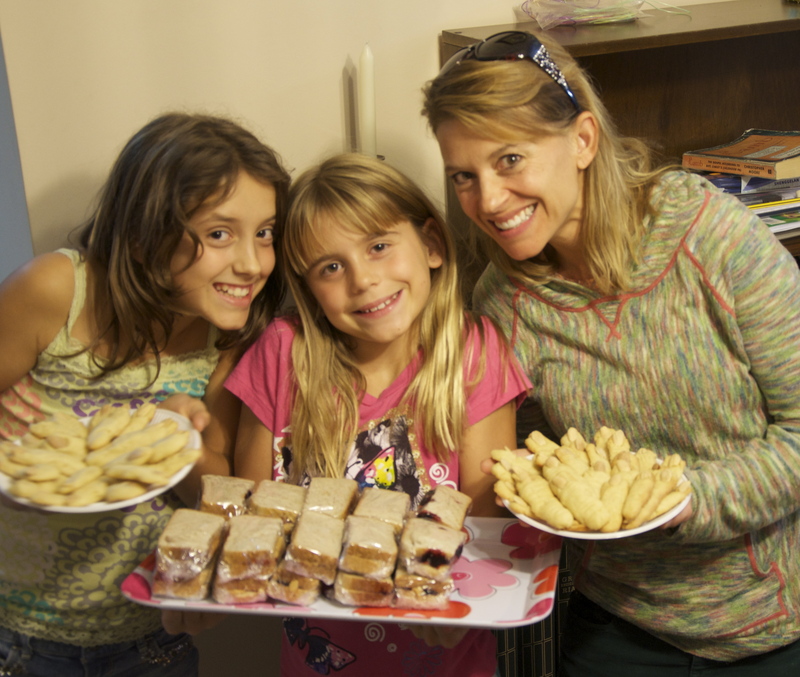 We were delighted to be included and agreed to run a station and bring a typical American snack. 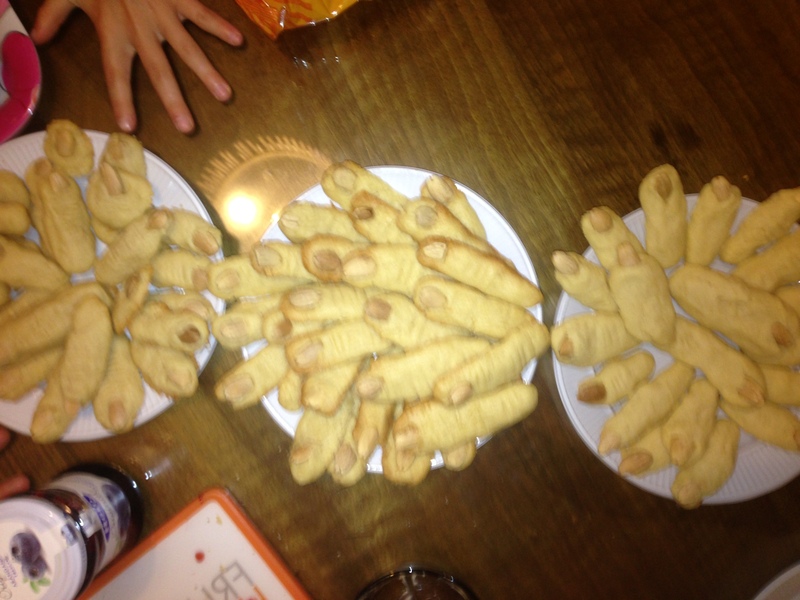 We googled Halloween cookies and although we had never had them before we thought “witches’ fingers” would be a good Halloween snack. 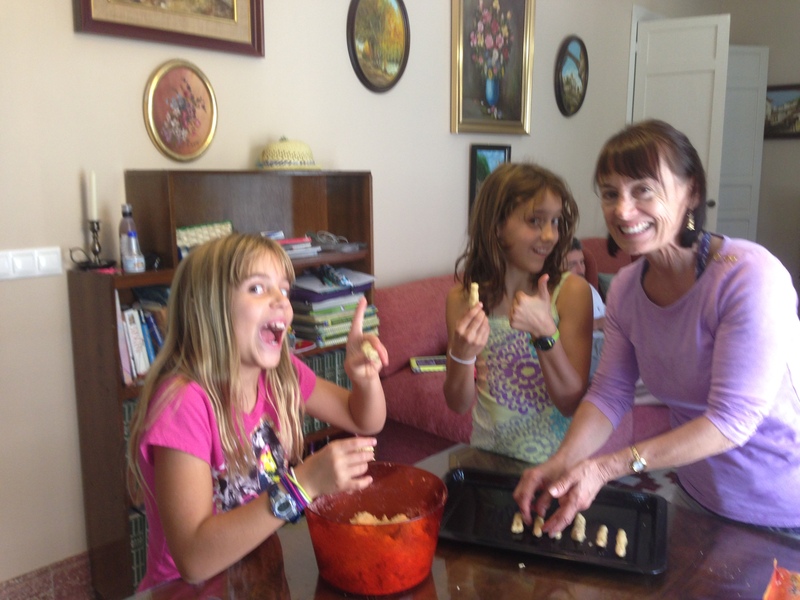 Grammy took charge of making the cookies. Sky and Savannah were in charge of forming the fingers and adding the “fingernails”. We also made Peanut Butter and Jelly sandwiches. Javier, the school director, enjoyed hearing us say peanut-butter-and-jelly more than the sandwiches themselves. “Say it again!” he laughed calling a friend over to listen to our funny accents. 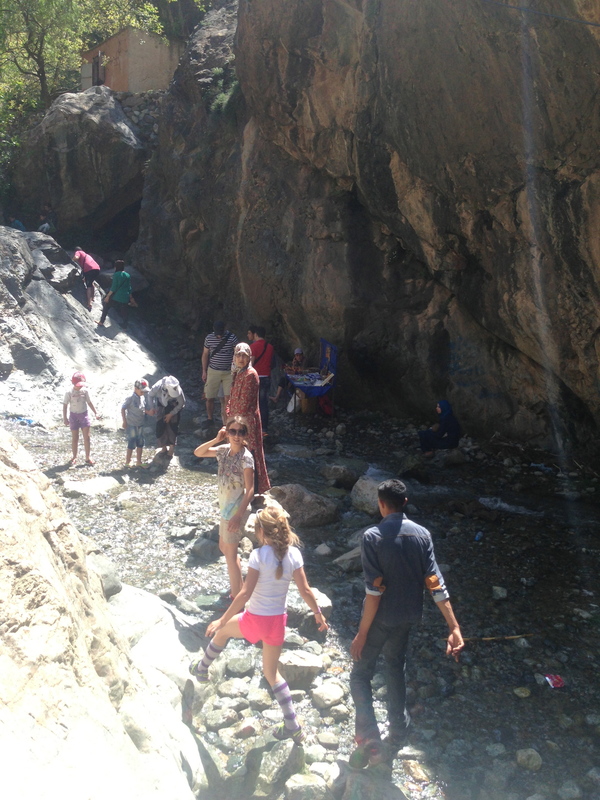 We hiked in a long line of children, parents and teachers down into the gorge across one road and onto a trail into the forest. 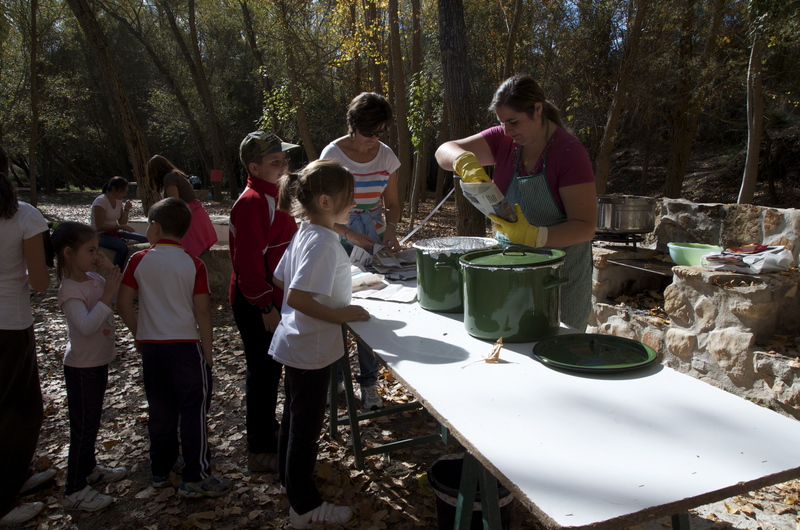 We set up the festival under the shade of tall trees at a picnic ground by the local lake, Embalse de los Bermejales (this is different from the Lake Bermejales that we run around). Mom, Dave, Mike, Spencer and I manned Estacion #3. Spencer is a young man from Tennessee who is teaching English at the school this year. Since he is the other American he was assigned to our group. We really like Spencer so we were glad for his company. Our station was called “Coma manzanas sin los manos” (eat apples without your hands). 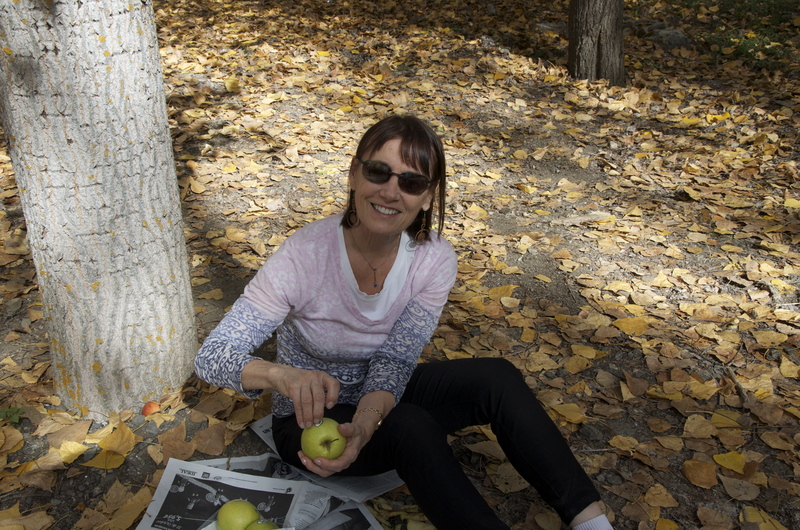 We sliced apples and dangled them from a string hanging between two trees. We gave the instructions in Spanish and had the kids repeat them after us in English. We were supposed to be teaching some English so we quizzed them on the words for fruits and vegetables. 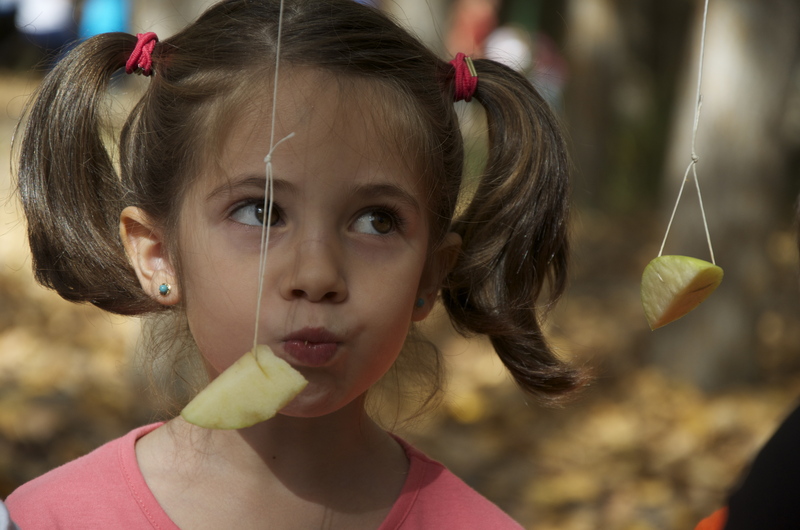 The children were pretty hungry and were motivated to get the apples without using their hands. It was fun to watch. 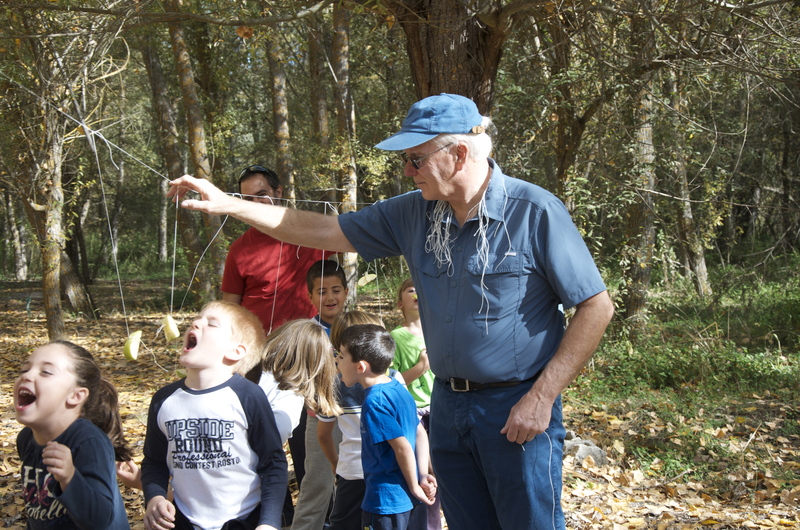 In every group there was always one kid, usually a big boy, who would demand that his string be reloaded several times. 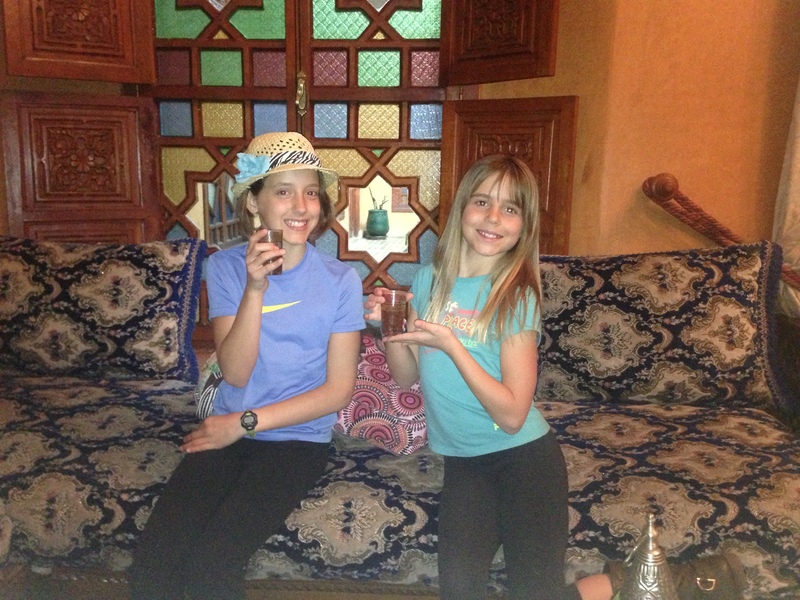 Sky and Savannah stayed with their classes. They had sack races, a mask-making station and other games. Once every class had rotated through all the activity stations, it was time for lunch and most of the parents began arriving. One mother roasted chestnuts and passed them out wrapped in newspaper. Tables were set up and the food was laid out. There were Tortilla Espanolas (thick egg and potato omelettes), Empanadas, fried fish, and an entire table devoted to what else, jamon. We visited with the other parents and tasted all of the foods. 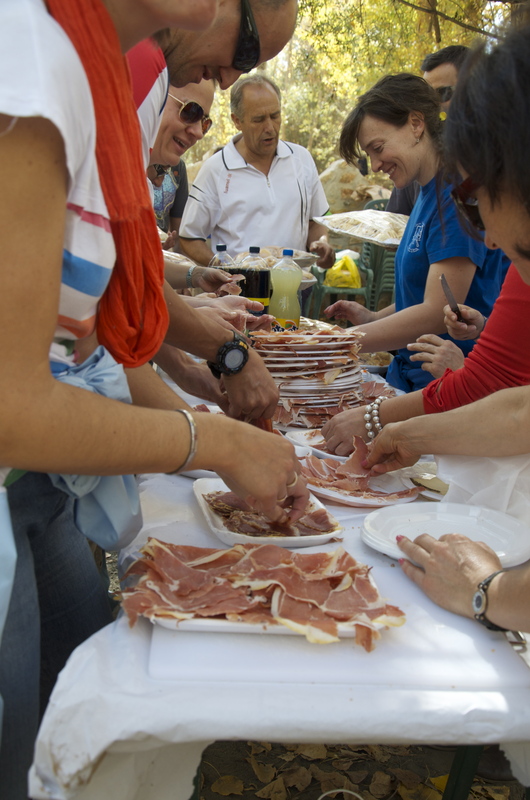 I had to explain at least 6 times that I was certain that the jamon was delicious but that I was a vegetarian. 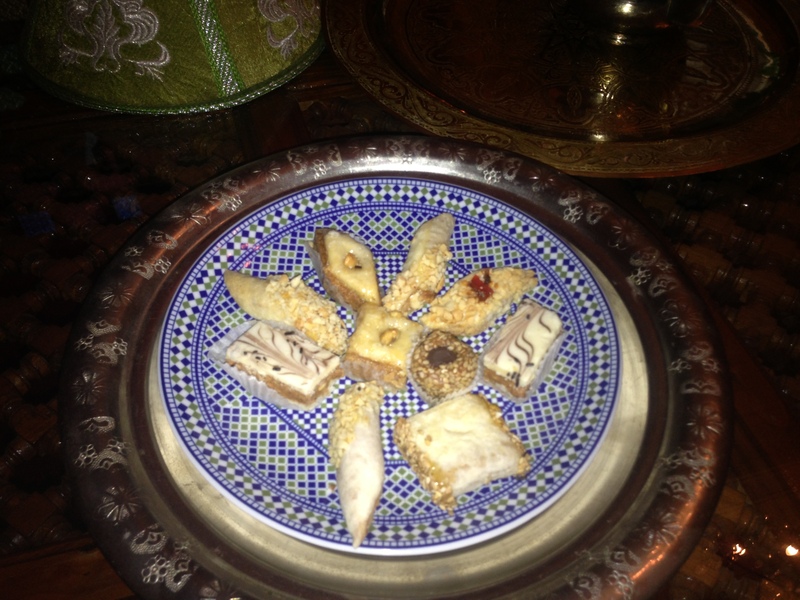 Mike just kept some on his plate to prove that he was enjoying it. 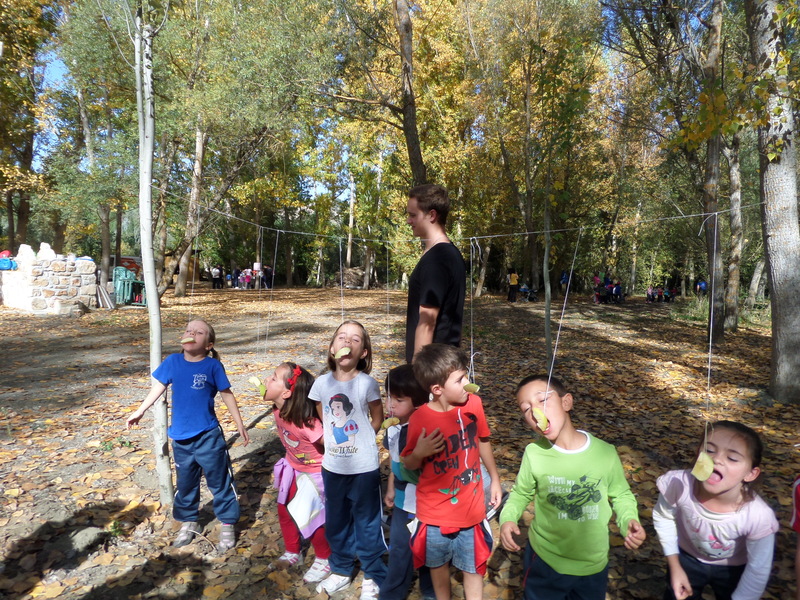 After everyone had eaten, Javier jumped around and announced that it was time for some games. 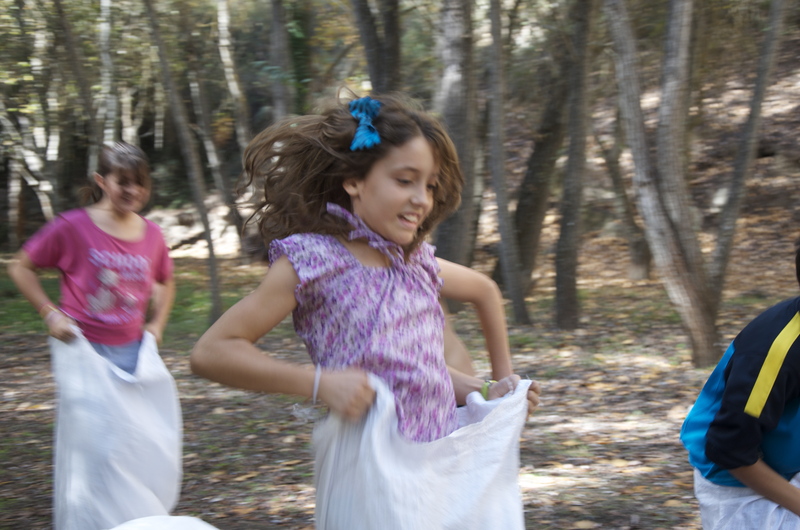 I volunteered for the sack race. Spencer joined me. Spencer has a rule that he must never say no if he is invited to try something as long as it is not unhealthy or illegal. I knew when Javier approached him that he would be lining up for the race! Spencer won and was awarded a bag of candy which seemed to come with about 40 children. They surrounded him and left him with an empty bag. He was smiling, what a prize! 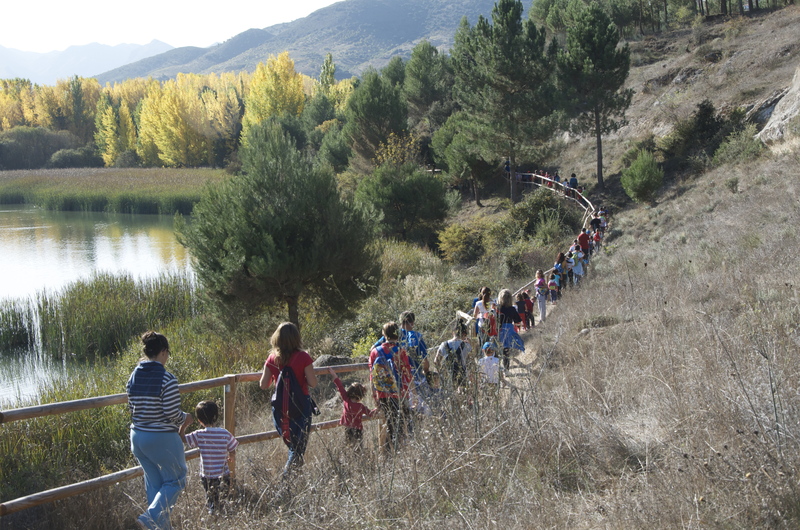 Full of fried calamari, tortilla Espanola, witches’ fingers, and jamon we all hiked back to the school. 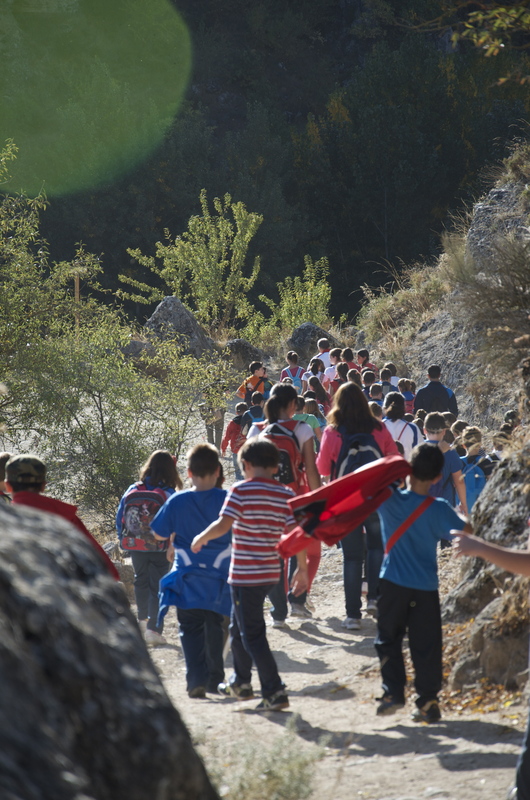 It was a long line of tired children who hiked the mile back to school. I was impressed that even the tiny kids hiked without complaint. Javier took up the rear making sure no one got lost. It was evening and we were all tired. It felt good to have had a station of our own to run. 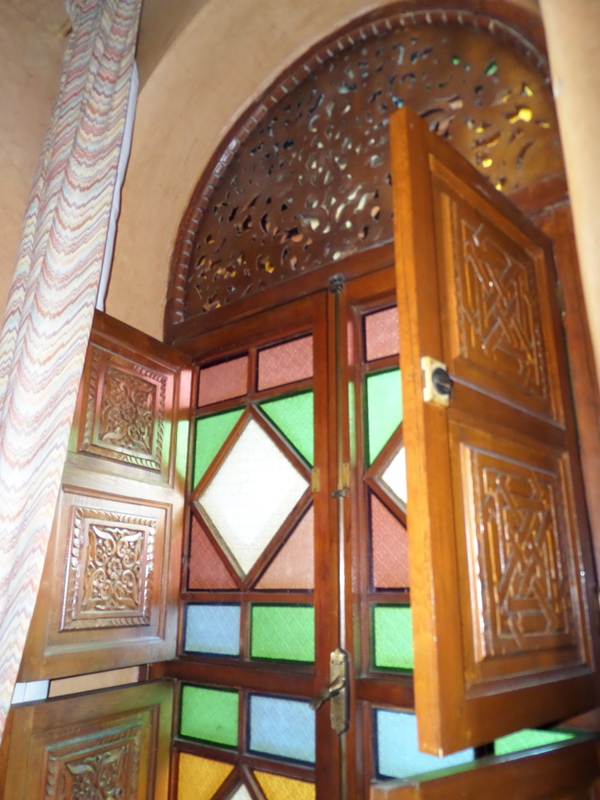 We felt welcomed and part of the community which was lovely. Team Kezmoh and Grammy and Grampy went home and watched Despicable Me and went to bed. Stay tuned for more adventures of Team Kezmoh and visitors. 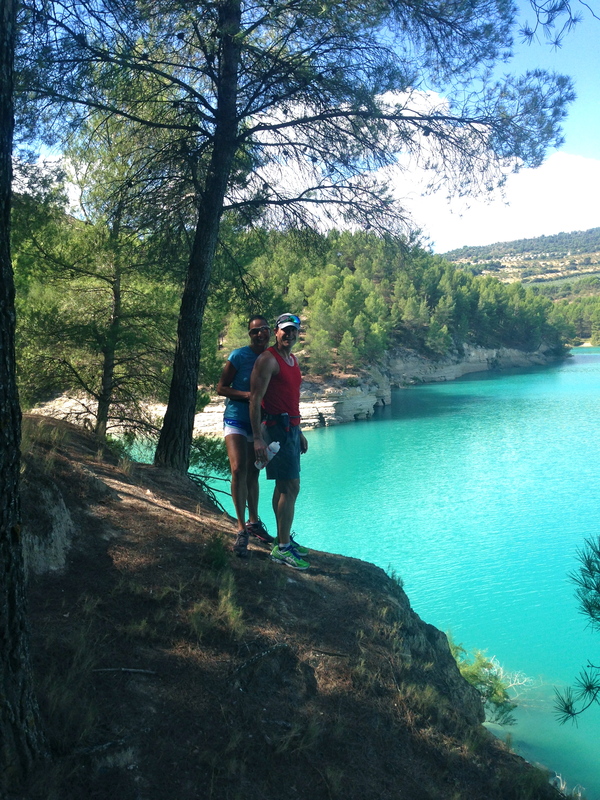 Alhama de Granada is an amazing running destination for the trail runner. 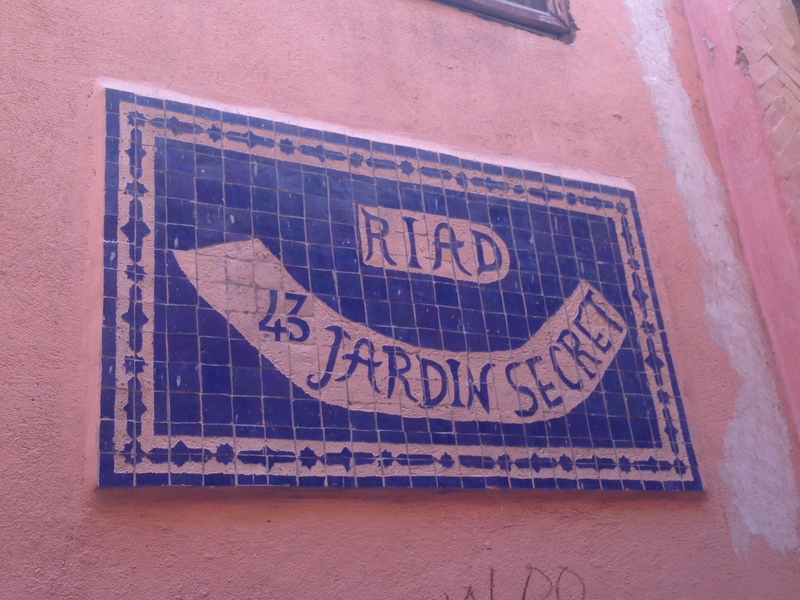 Mike and I discovered this area when we came in 2011 on a fact-finding-mission. 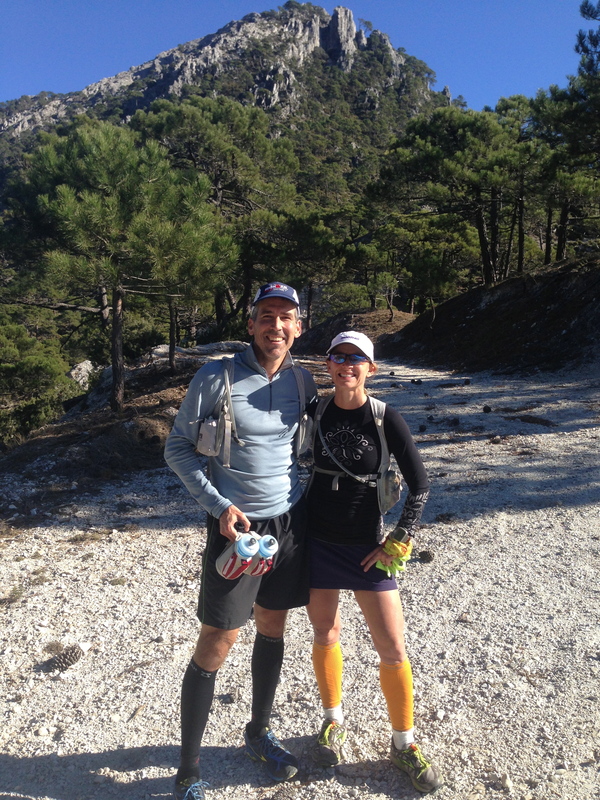 I typed trail run Spain into the computer at home and guess what? 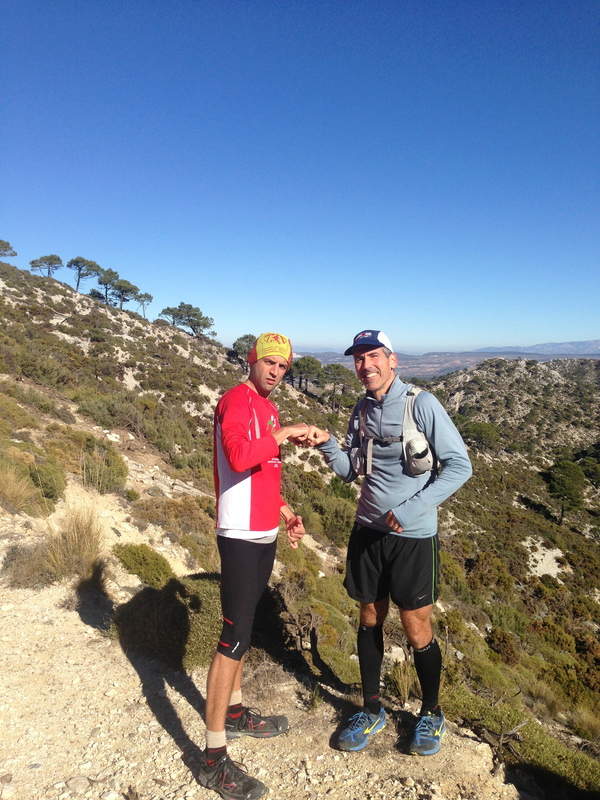 There is a website called trailrunspain.com. Our friend Paul Bateson is the keeper of this site. 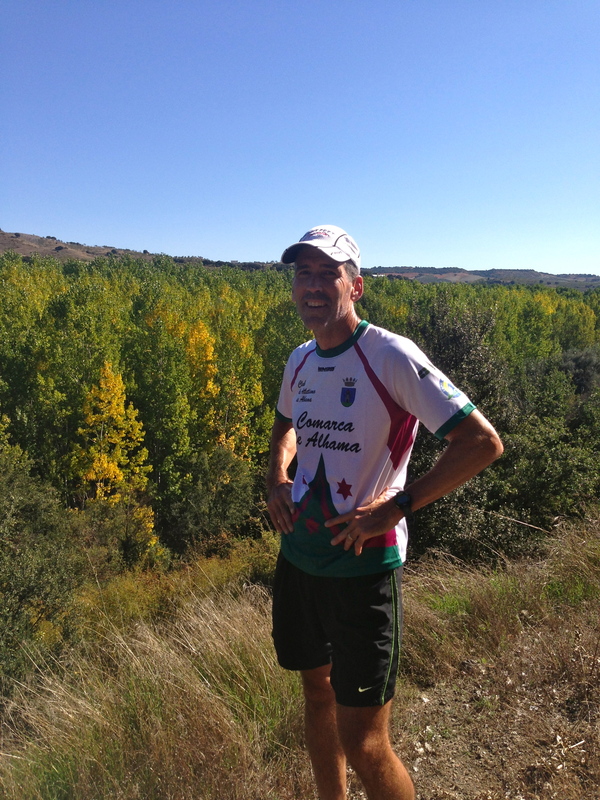 He organizes trail running holidays for people visiting Andalucia. When we came 2 years ago we ran with him for 3 days. We ran from village to village carrying all of our gear. We each carried a small pack. I brought a rolled up sundress, underwear, an extra pair of socks, flip-flops, a toothbrush, toothpaste and a comb. 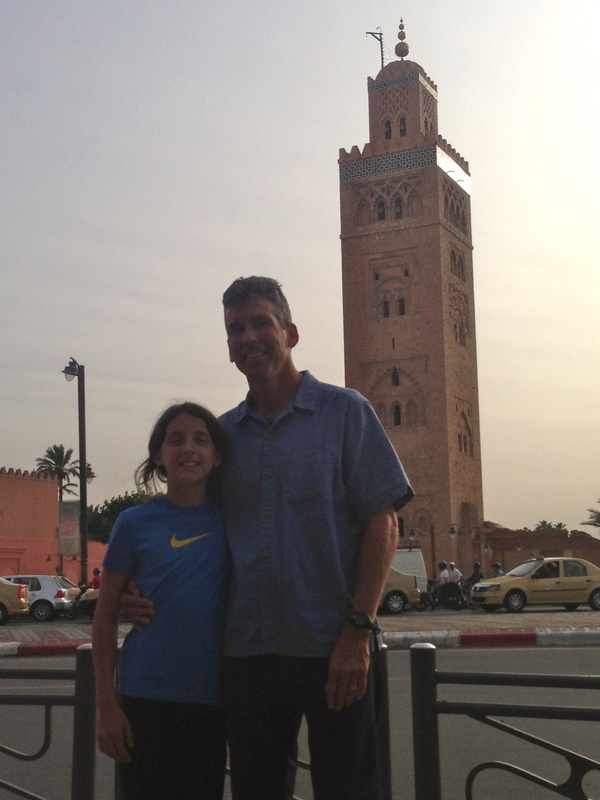 We rinsed out our running clothes at night and stayed in hotels. 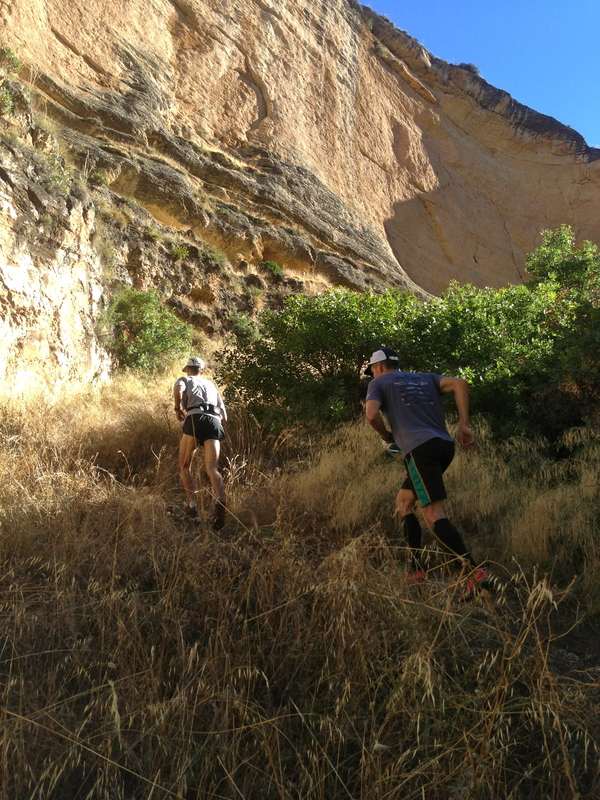 We ran 18-25 miles each day over and around the nearby mountains of the Parque Natural Sierras de Tejeda. Recently Paul’s knees have not been behaving well so we’ve been having fun acting as his substitute running guides. 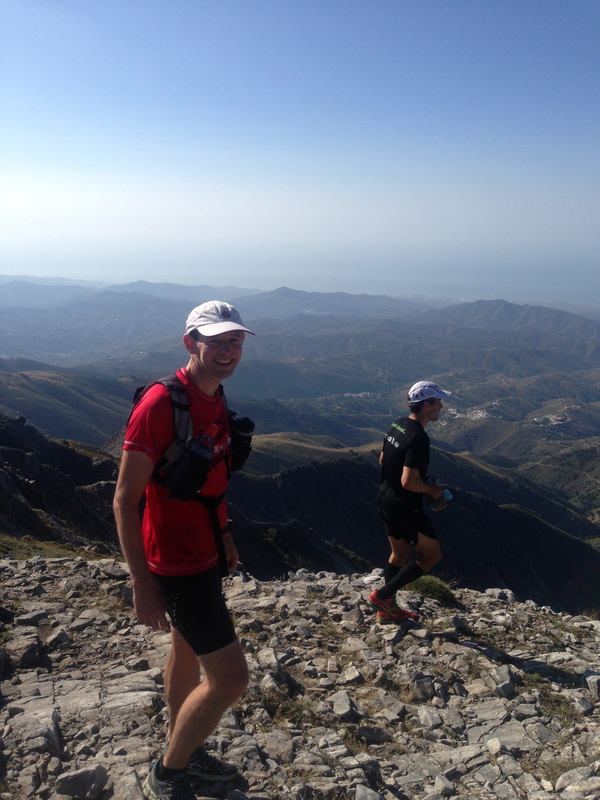 The first week we ran with Dominic, an English banker based in Hong Kong. Last week we spent with Rob from Holland a computer programmer and a wicked hill climber. They were both good runners so many days Mike would run on ahead with them and they would wait for me at the top of big climbs. 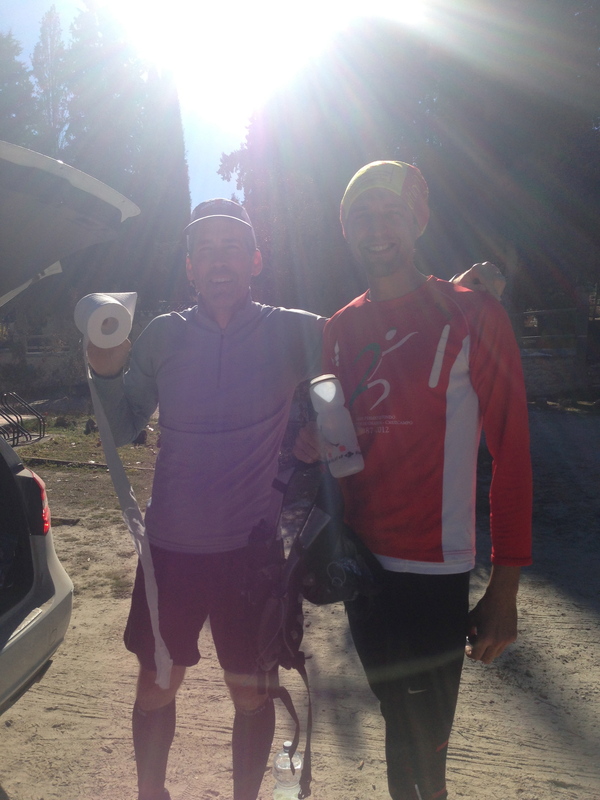 La Maroma: We did this run with both Rob and Dominic. It starts at 3000 feet and is 10 miles round trip. The top of the mountain is 6800 feet according to my Garmin altimeter. I would like to make it 22 miles round trip and leave from home but I haven’t gotten to that run yet. The trail starts on an upward sloping dirt path that becomes gradually more steep and eventually more and more rocky until we can only hike. Sky and Savvy hiking up the trail to La Maroma. We didn’t torture them with going to the summit. 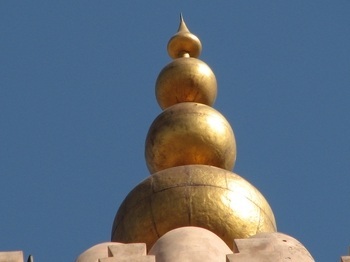 There is an incredibly rewarding view at the top. 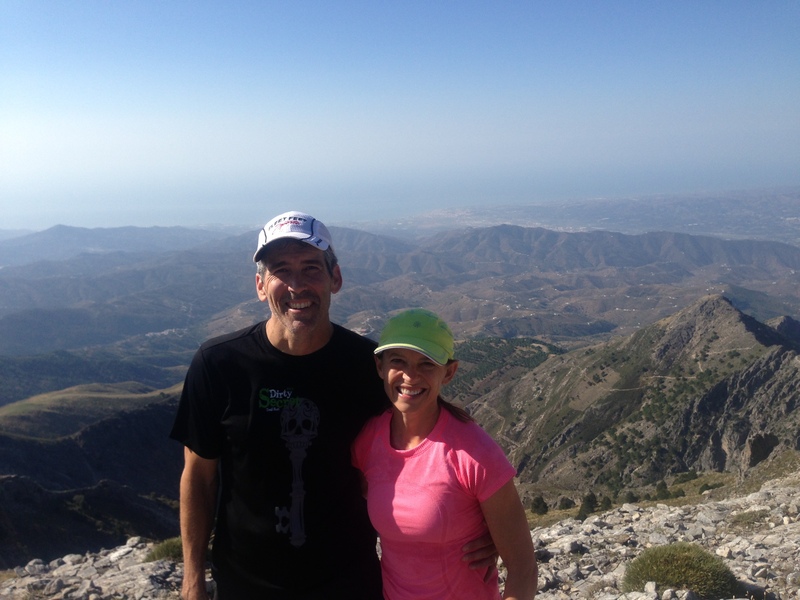 We live on the inland side of the mountain so it is a treat to be able to see the Mediterranean Sea from the summit. We expect that on a really clear day we would be able to see Africa! The famous (well now it is!) Rickety Bridge! This is an 8 mile loop from our door that is really nice. It is full of rolling hills all of which are run-able. We like to do this loop after we take the kids to school. The school is in the gorge so we just keep going after dropping them off. 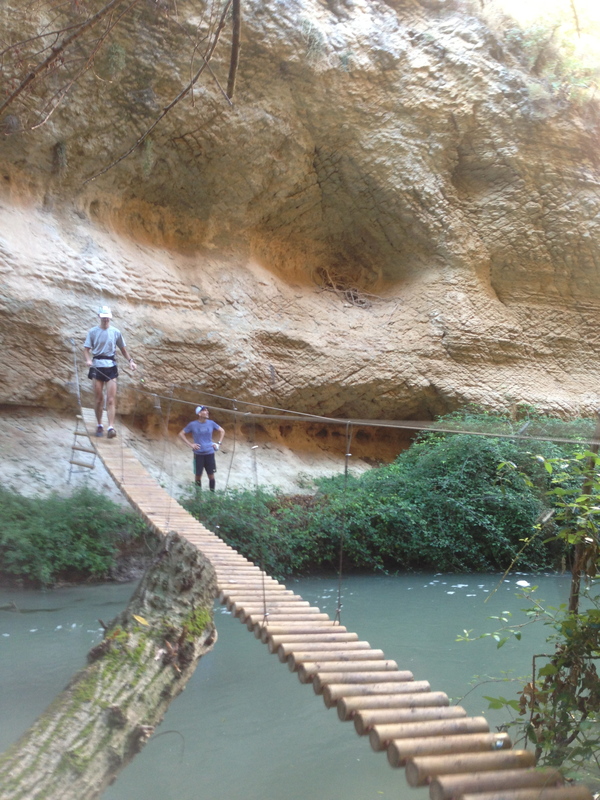 We run into the canyon along the Alhama river We cross a small foot bridge and shortly come to a little dam. There is a guard dog who lives on the levy behind a fence next to the dam. He has very little space to run so Mike feels bad for him. He looks pretty ferocious so I am glad for the chain link fence between us. Mike wants to befriend him so he carries treats in his pocket to toss over the fence for him. Past the dog we take a dirt road mostly uphill to the “rickety bridge”. 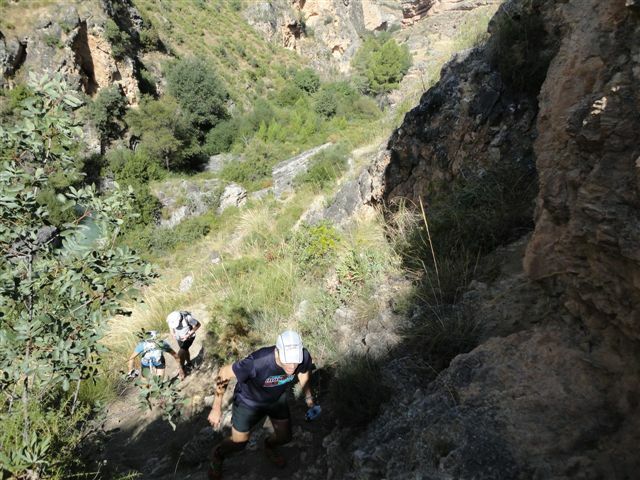 The bridge is the midpoint of the run and from there we climb up a lovely dirt path that rolls past cortijos (farmhouses). Our favorite is Cortijo Bernardo. The day I brought my camera Bernardo was in his garden pulling weeds while Stevie Wonder sang “I just called to say I love you” from a small radio. His wife Francisca was concerned that I was so sweaty and came over to feel if I was as wet as I looked. We explained that we were just running and complimented their lovely gardens and ran off down the road. Next, we pass fields of tomatoes and corn with the sound of rushing water from the river below us. There are a couple of friendly dogs who come out to greet us and usually join us for a short way. They don’t need treats because they already seem happy. Here I am running with my friend Kathryn! Miss you! Eventually we loop back past the gorge and the school. If we time it right we can wave at the girls during recess. Sometimes we try to spy on them but one of their friends always spots us and points. 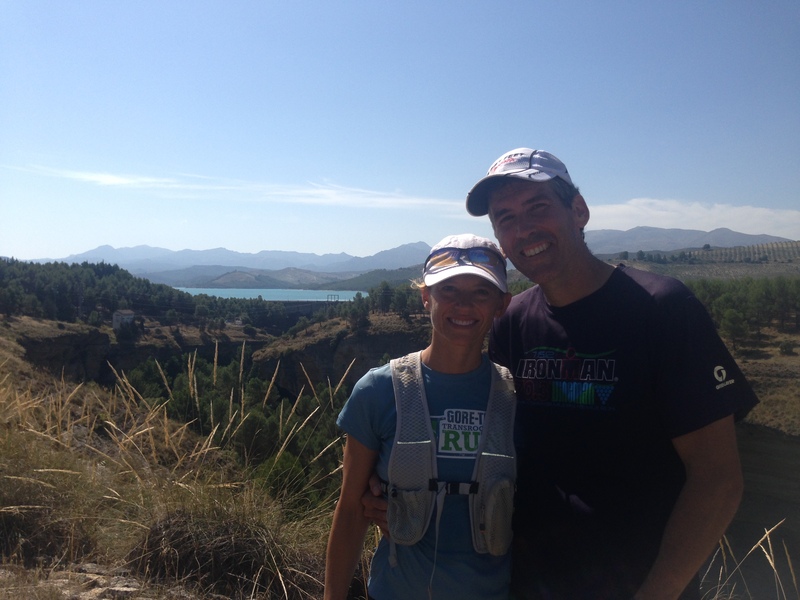 This run starts by Lake Bermejales about 10km from Alhama. The first 3.5 miles is along the top of the gorge on a dirt road that winds through tomato farms and olive trees. Mike and Leslie after a run in the Gorge. Lake Bermejales in the background. 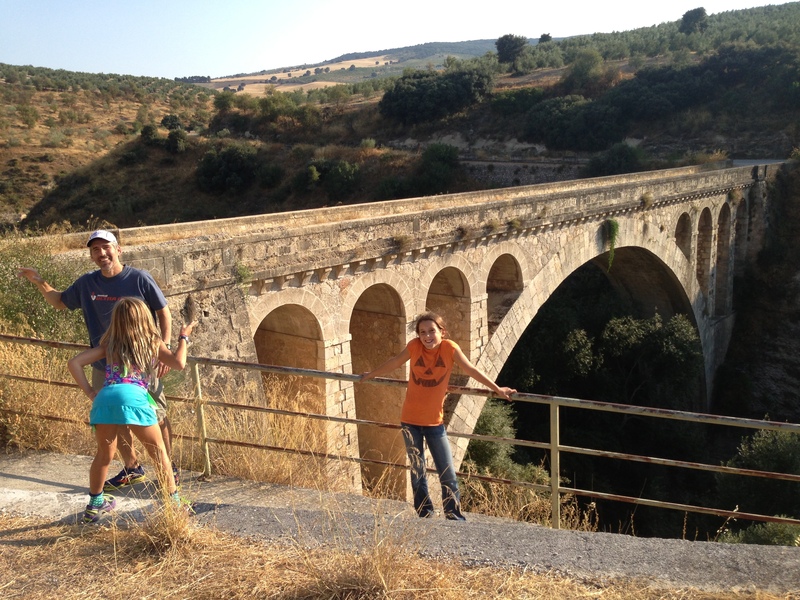 The road crosses a Roman Bridge, El Puente Romano over the Rio Cacin. Just before the bridge there is a trail that drops sharply into the gorge. There are boy scouts who spend the summer at a camp near here. 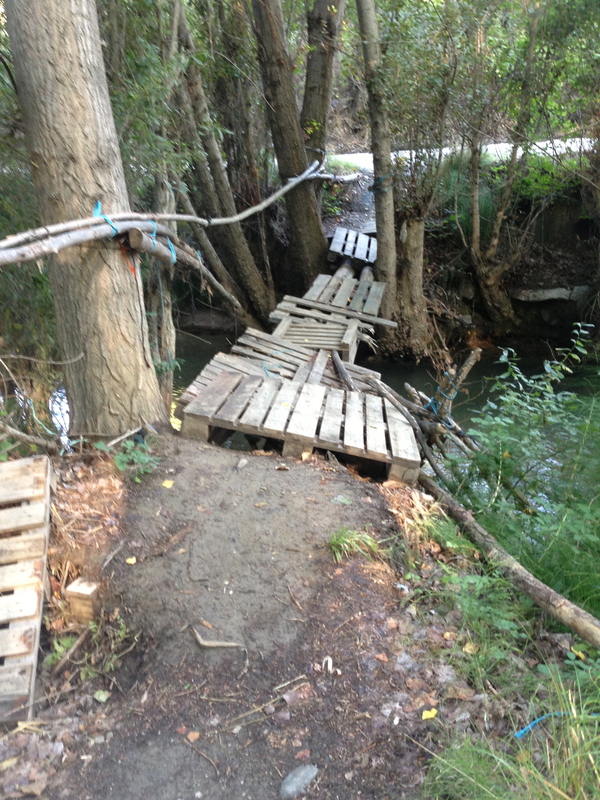 They keep the trail clear and set up ropes and bridges to cross. 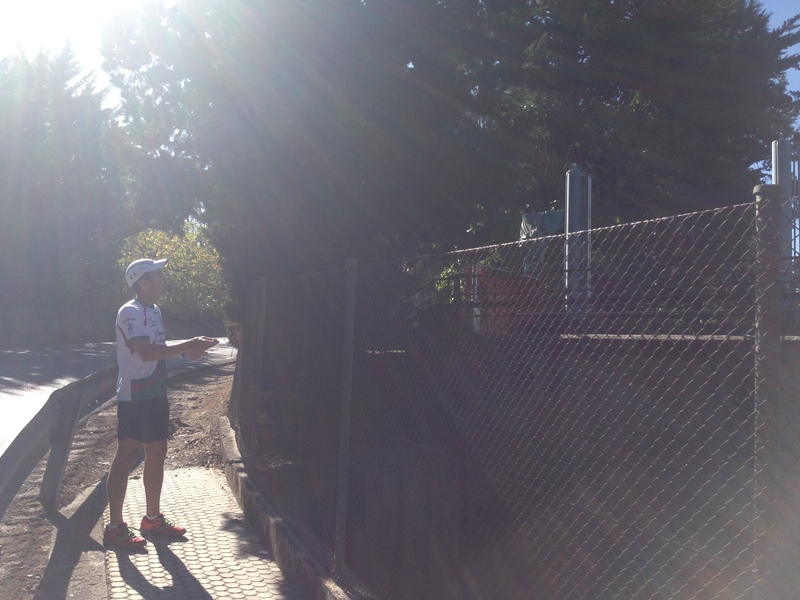 One of our favorite runs back home is the Lake Natoma Loop so it seems fitting that we found another lake loop to enjoy. 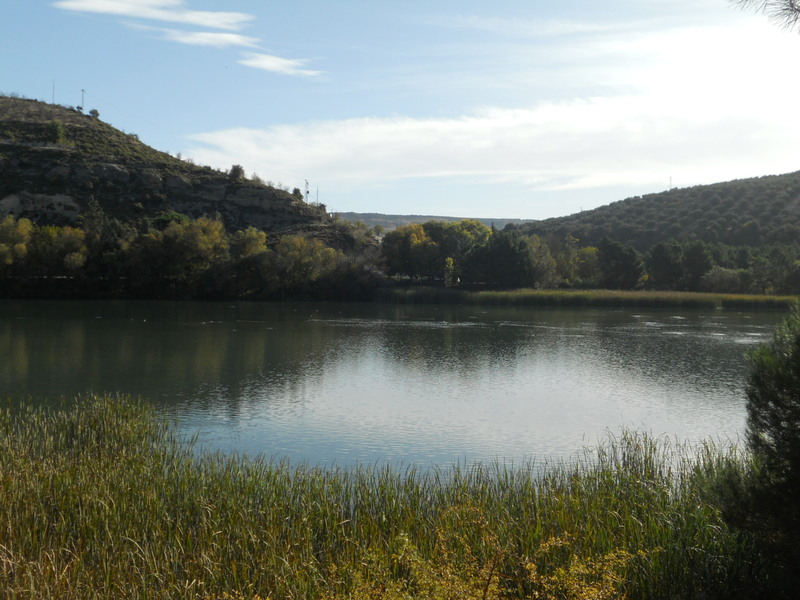 Like Lake Natoma, Lake Bermejales is a man-made lake with a dam. It is 15 miles around on a mix of trail and a bit of road. The trail darts in and out of coves through neat rows of pine trees. 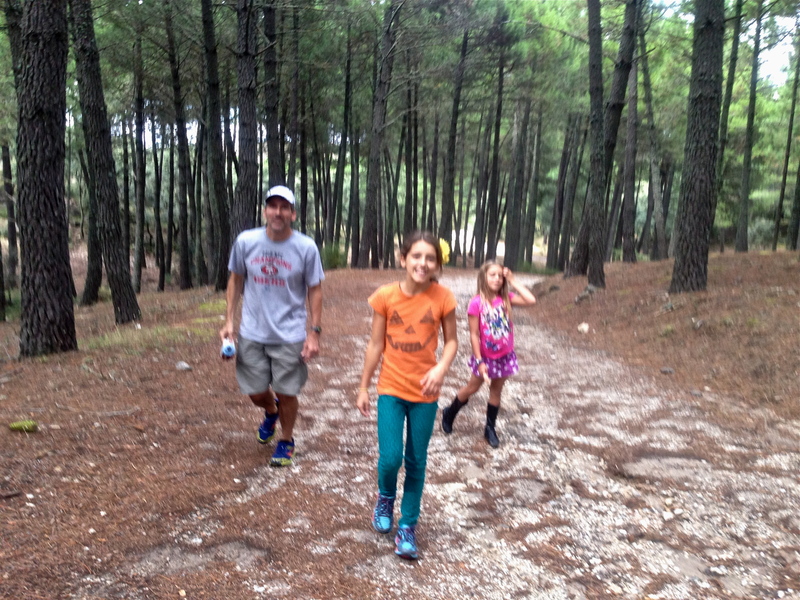 The trail is a soft cushion of pine needles, gentle on the knees. It is stunningly beautiful. 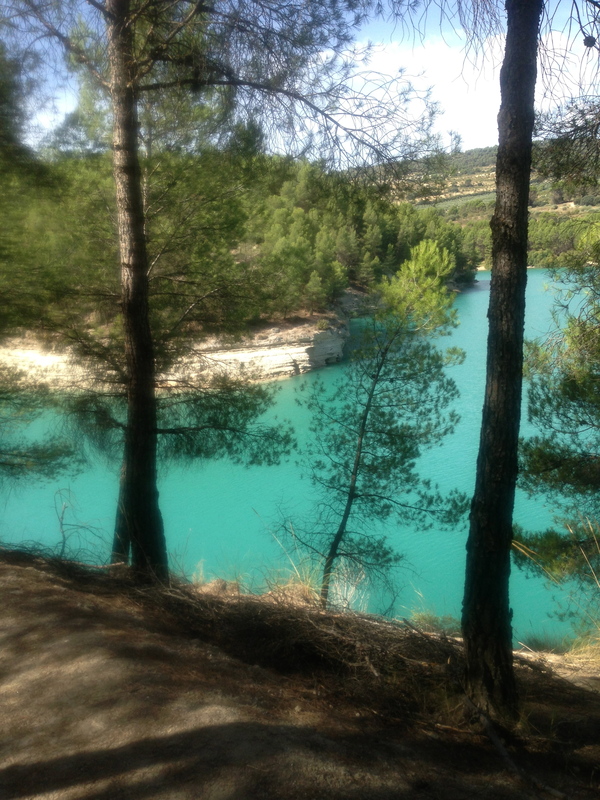 The lake is very clear and in many places a surreal mix of greens and blues. 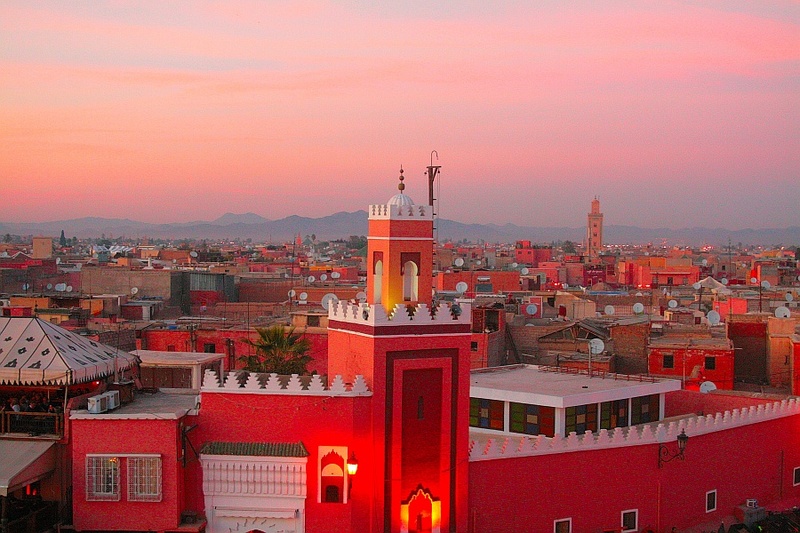 The unearthly colors seemingly change around every corner. From the bridge at the dam we see large fish swimming deep in the crystal waters. We have done this loop with all of the visitors so far. 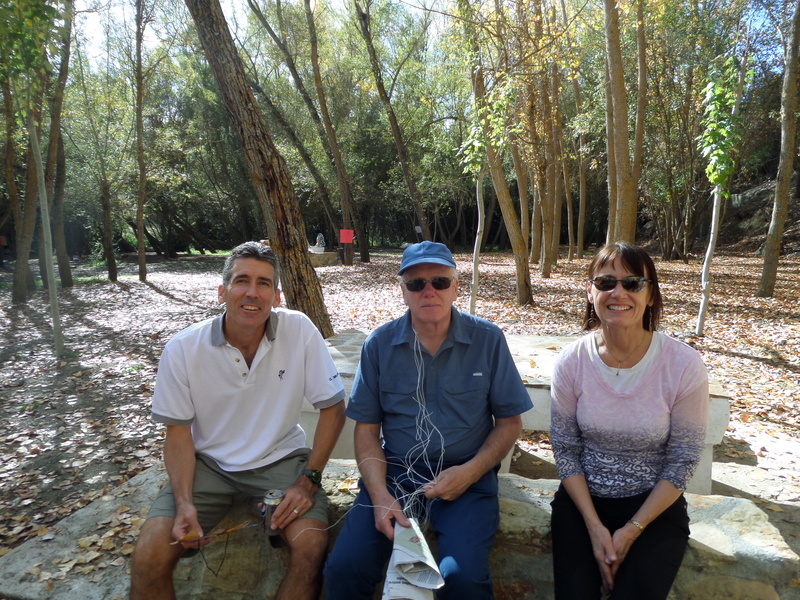 Most recently Colleen and Jeff from Toronto, Canada joined us. 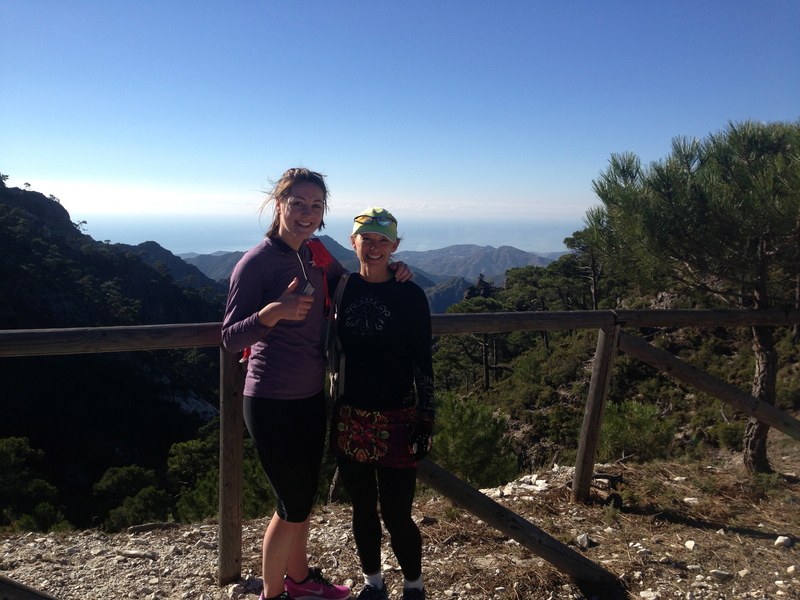 If anyone whats to come to join us on a run in Spain just send me a comment! We would love to have some company. You can also e-mail me at LKEZMOH@gmail.com!